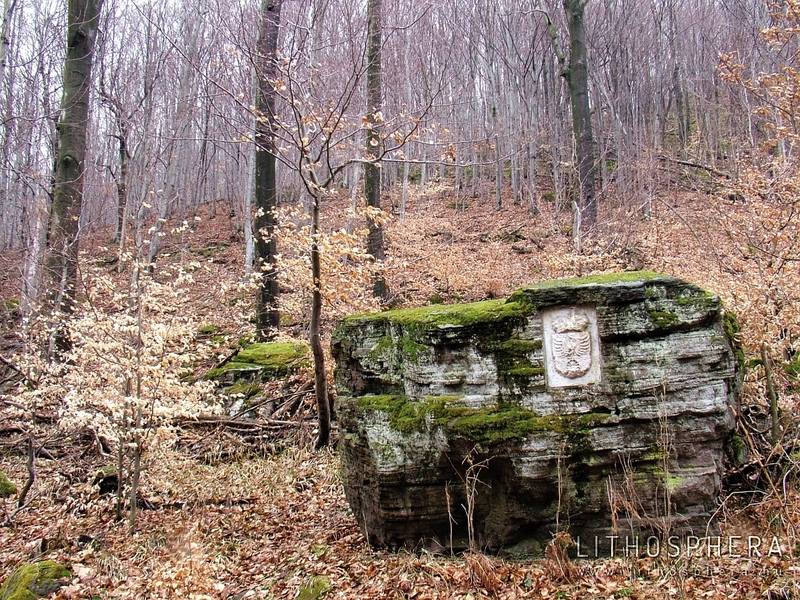 The Mátra Forest is one of the few historical landscape names in Hungary. It was first mentioned by the nameless notary called Anonymus in his work titled as Gesta Hungarorum (11th or 12th century) under the name ‘Silva Matra’, i.e. Mátra Forest (Hevesi, A. 2002). Later on it was also referred to by the phrases ‘the Chain of Mátra Mountains’ by Sovereign Ferenc Rákóczi II. (1716, 1739), ‘The Mountain Range of Mátra’ by János Hunfalvy (1863) and ‘The Mountain Chain of Mátra’ by Károly Ballagi and Pál Király (1878) used for the southernmost range of the Northwestern Carpathians running from the Börzsöny to the Eperjes–Tokaj Mountains. The name unremembered at the early 20th century was attempted to be revivified by Gyula Prinz during the second half of the 1930s. In his book titled Hungarian land, Hungarian species, the two-facedness of Upper Hungary (benamed by him the Upland) with its two individual characters is pointed out. As described, the lower echelon of the Upland, i.e. the mountains located south from the basins of the Ipoly and Sajó rivers, is scientifically called Southern Upland that he would replace by the folkish Mátra Forest. 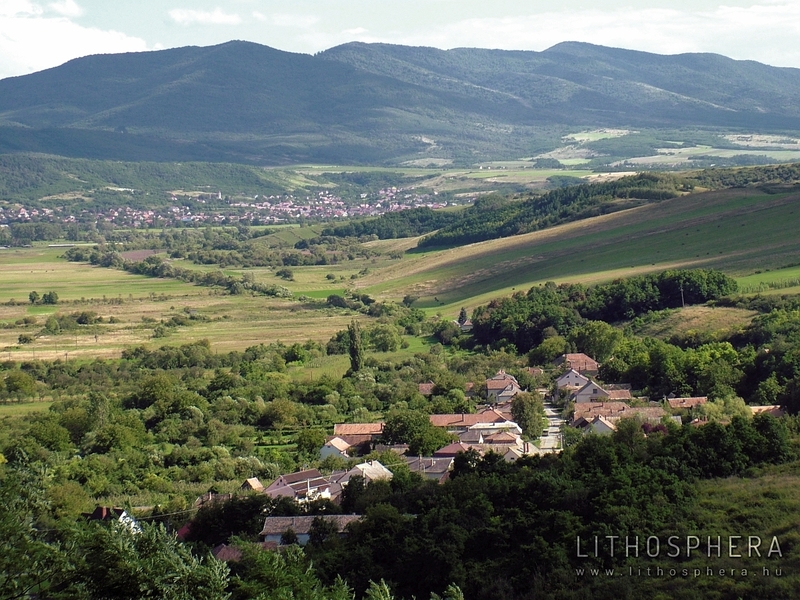 In the very end of the 20th century, the reviving of this original geographical landscape name was proposed by József Hajdú Moharos and Attila Hevesi (1997, 2000) to replace the landscape names North Mid-Mountains of Hungary (Bulla, B. 1951) and North Hungarian Mid-Mountains (Pécsi, M. – Somogyi, S. 1967) established by necessity after the demarcation by the Treaty of Trianon. The area of the Mátra Forest in today’s Hungary includes the mountain ranges of the macro-landscape North Hungarian Mid-Mountains from the Börzsöny, through the Cserhát, Mátra and Bükk regions and the Aggtelek–Rudabánya Mountains to the Tokaj Mountains. Moreover, it also extends to the Hungarian-Slovakian cross-border regions of the above landscape units, e.g. the Burda Mountains (Burda) as the continuation of the Börzsöny Mountains beyond the River Ipoly, the Cerova Mountains (Cerová vrchovina) as the northern continuation of the Medves Region and the Gömör–Hevesi Hills, the Slovak Karst (Slovenský kras) as the continuation of the Aggtelek–Rudabánya Mountains (together referred as the Gömör–Torna Karst) and the Slanske Mountains (Prešovské vrchy, Slanské vrchy) as the continuation of the Tokaj Mountains (together Eperjes–Tokaj Mountains). From another approach, the Mátra Forest partly coincides with the Palóc Land, or more precisely with the area referred to by ethnography as Palóc centre, i.e. the region (‘ethno-cultural unit’) populated by the Palóc ethnic group. „….with all our knowledge of science and enlightenment, we can also experience the mysterious magic influence of the mountains. We feel spiritualised on the peak (…) and forethought the invisible powers, our souls were obsessed by the presentiment of God. And we sense and realise the religious mentality of the foretime, the cult of mountains” (Herrmann, A. 1893). This may be an explanation for the mountains’ extremely abundant world of myths, ‘the last resource of the former world of spirits’. 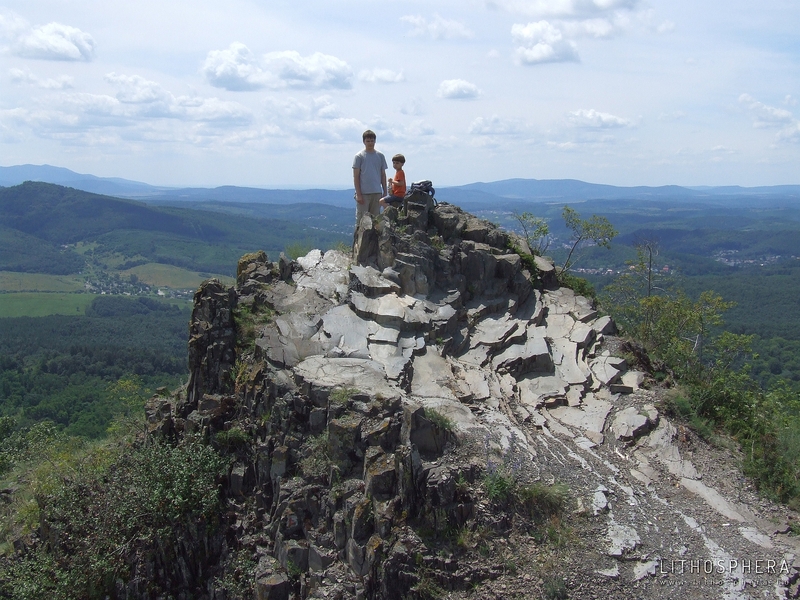 Many hills and rock formations are known from the area of the Mátra Forest to which, myths and tales, linked to folklore transcendent in origin are connected. Often it is the rocks’ shape different from regular or bizarre being the reason for particular imagination or have a subconscious special power. The bizarre rock formations’ “stiffness and relative permanence will be the causative of the most impressive illusions as representing or imitating subjects of the living nature or human art with a surprising resemblance” (Hanusz, I. 1900). The ‘lapidified’ type myths make up a separate group (Ipolyi, A. 1854, Szendrey, Zs. 1922, Magyar, Z. 2006). Among the ‘devil’s towers’, some of the most familiar one are the Devil’s Tower of Cserépfalu (and the ‘Devil’s slide’ different in terms of its range of landforms, however with an akin origin from the folklore point of view), the János Ördög Rock found at the hillside of Pogányvár at Óbást (Stará Bašta) or the block of the Gyűr-tető of Abaújszántó named Devil’s Rock. 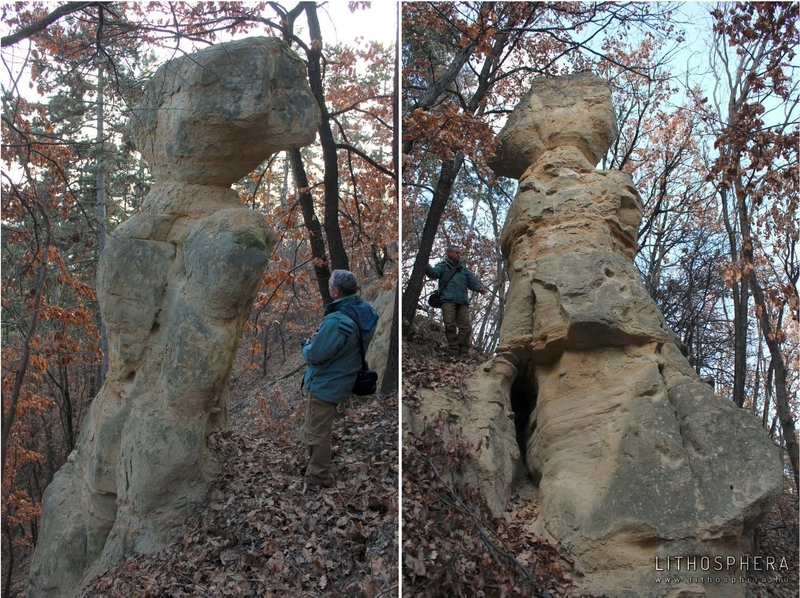 At many locations, ‘human rocks’ can be observed as for example the Leány-kő at Nemti, the Barát (Friar) and Apáca (Nun) rocks (also known as Idol rocks), the Human Rock located at the hummock above the Szuha Valley of Bózsva and on the Korom Hill of Füzérradvány, as well as the ‘Rock Lady’ of Regéc. At Istenmezeje, according to the folklore, not a person but the vine-stocks at the hillside became lapidified, developing the special rock formations of the ‘Vineyard of Noah’. The belief in witches is regardless of geographical regions. It can be observed in the Medves Region (Boszorkány-kő) as well as in the Tokaj Mountains (Nagy-Kopasz, Gergely Hill, Kopaszka near the Town of Sátoraljaújhely). Apparently, there are local attributes, e.g. 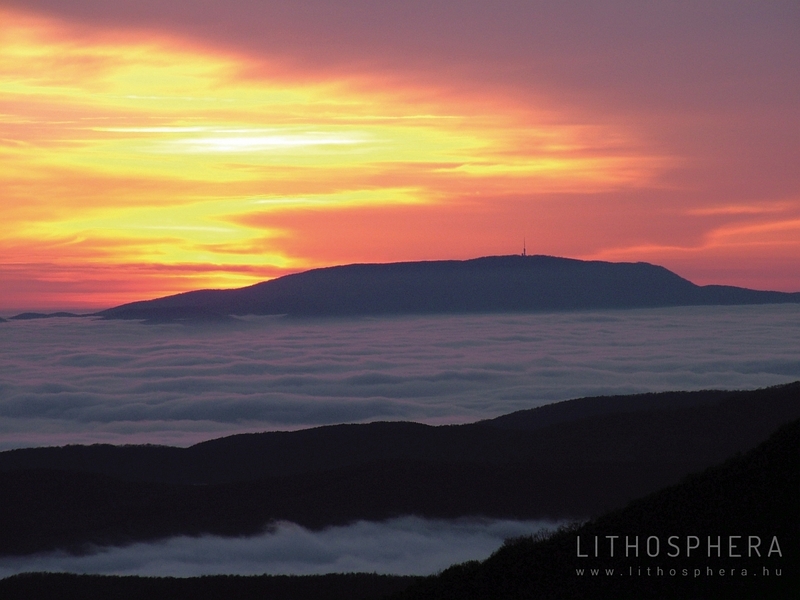 in the area of the Tokaj Mountains, witches typically had their assembling points at hilltops (Aba, I. é. n.). 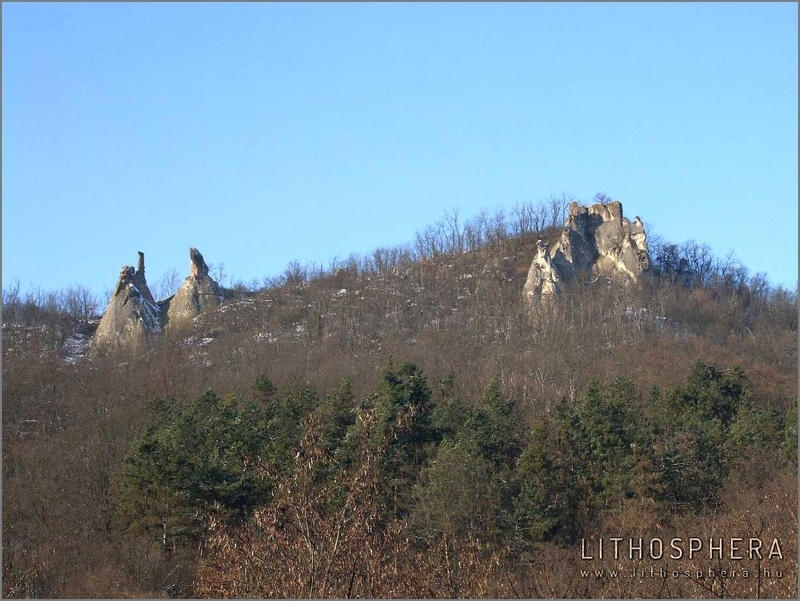 Flat-knapped hills were regular locations to the dance of witches in the popular imagination for which a good example is the Kis-Salgó also known as Boszorkány-kő (Witch Rock), i.e. one of the basalt elevations of the Medves Region. 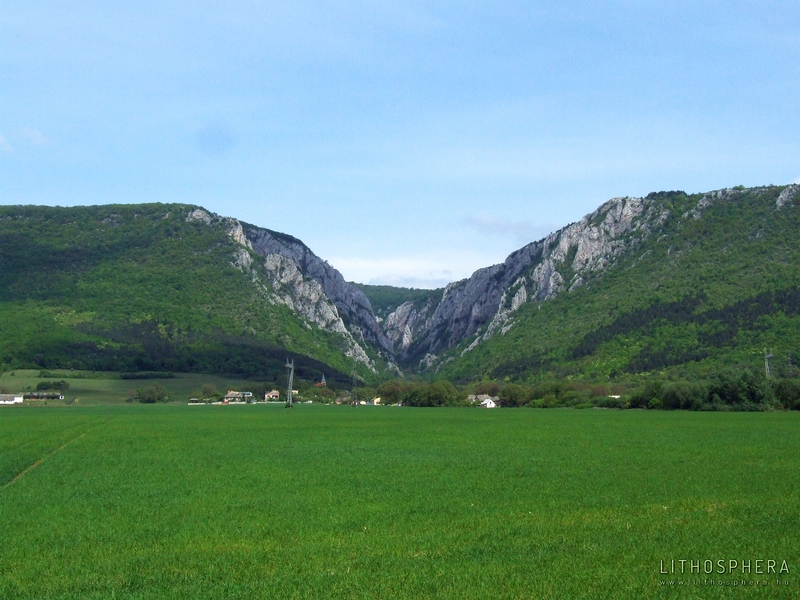 Among the ‘places of fable’ associated with negative surface landforms, the most well-known are gorge valleys developed by the leaping of King Szent László (Saint Ladislaus I). In the Mátra Forest, this is how the formation of the Tornai Gorge (Valley of Szádelő) (Stibrányi, G. é.n.) and one of the valleys of Mátraverebély–Szentkút is explained by folklore. Nearly all known caves are associated with a local legend. The most common one are stories linked with robbers, and hermits (e.g. Suba-lyuk, Pongor-lyuk and Barkó-lyuk caves in the Bükk Mountains) as well as the ‘hidden treasure’ theme (e.g. the Balla Cave in the a Bükk Mountains, the lava caves of Kis-kő at Szilaspogony, the basalt caves of Pogányvár at Óbást) is also frequent. Of the Bükk Mountains being the most abundant in caves among Hungary’s mountains, more than a hundred legends and tales were collected (Hazsliszky, T. – Regős, J. 2001). From the point of view of cultural history, in addition to the ‘marked caves’, caves of the primitive men known as archaeological sites are also important. 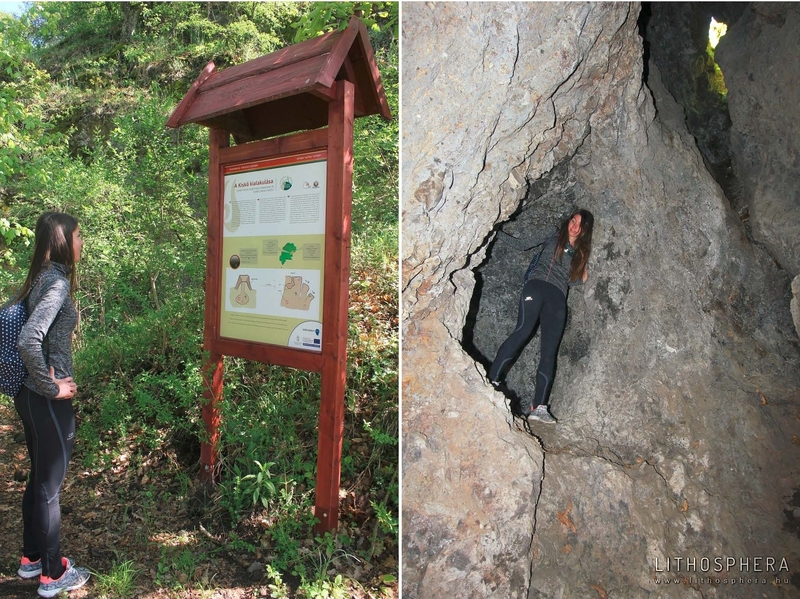 Among the several occurrences in the Mátra Forest, only few of the more well-known ones from the Bükk Mountains are mentioned here as examples: Suba-lyuk, Szeleta Cave, Cave of Istállós-kő, Balla Cave and Büdös-pest. Springs, related to their value of usage, are very often associated with legends, myths or irrational religious experiences (apparition, revelation, r the belief of miraculous recovery). “Although as written by the law of King Szent László (Saint Ladislaus I), anyone immolating at wells and springs as pagans, should redeem their misdoing by an ox, the esteem of Hungarians on springs and wells has not got extinguished, and even more, these two are mentioned as ambivalent” – cites Hanusz, I. (1902) on the esteem of Hungarians on springs. A group of marked springs are ‘king’s wells’ that usually memorialise former hunting of emperors. Several ‘king’s wells’ are known from the area of County of Hont evidencing the hunting of emperors from the Árpád House in the nearby areas (Hőke, L. 1866). 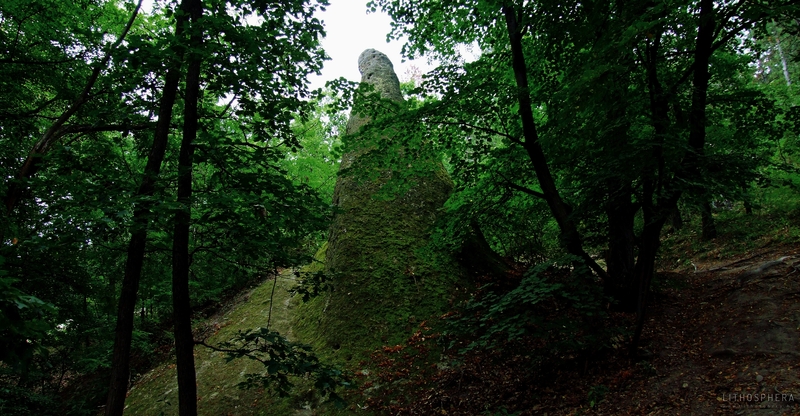 The Well of King Matthias at Telkibánya received its name from King Matthias Corvinus often hunting in the forests of the Tokaj Mountains rich in game. Another frequent motive is miraculous water wringing linked to springs. Among the springs wringed by King Saint Ladislaus I, the most well-known from the area of the Mátra Forest are the Szent László (Saint Ladislaus I) Spring at Mátraverebély–Szentkút and the Szent László Spring at Mátraháza (its former name being: Hármas Spring). The principal in certain versions of similar stories is King Szent István (Saint Stephen I), for example in Karancs. The aerated spring (‘csevice’) of Tar is thought to be the ‘tear spring of King Aba’ by the legend (Kandra, K. 1891). In the Tokaj Mountains, many springs are linked to the Rákóczi legends (Magyar, Z. 2000/b). The sovereign often had a sip from one of the springs with good water (e.g. the outskirts of Füzér, the Pusztavár at Komlóska and the valley of Mély-patak at Regéc) or watered his horse (e.g. around Makkoshotyka or the spring at the entrance of Kovácsvágás from the church), or took a rest at the spring while travelling (e.g. 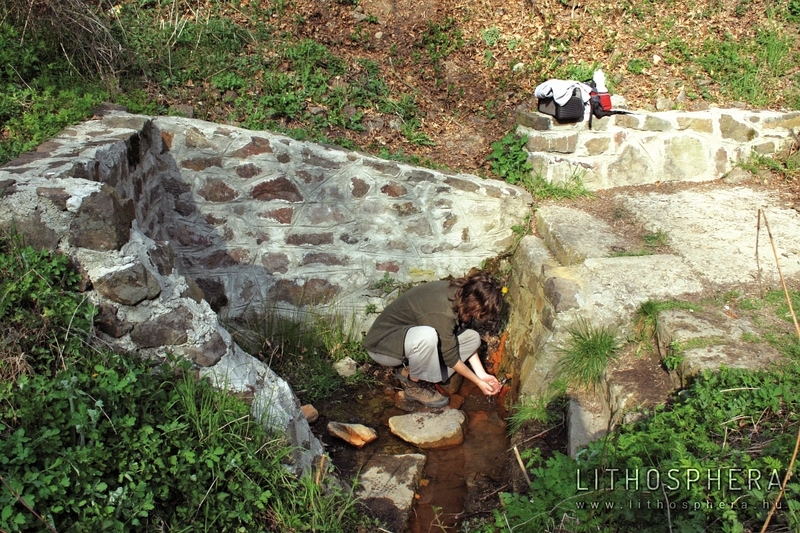 the spring near the Zsidó Meadow of Óhuta) or at times of hunting (e.g. the spring at the margins of Rudabányácska and Újhuta). The mementos of these are the many Rákóczi springs and Rákóczi wells. ‘Magic wells’ were honoured due to the associated curative feature and the miraculous event (recoveries, revelations and apparitions). Good examples are the Szent László Spring at Mátraverebély–Szentkút, the Tarác Well (Tarász Spring) at the Karancslapujtő side of the Karancs Hill or the Szent (Saint) Well of Fallóskút in the Mátra Mountains. 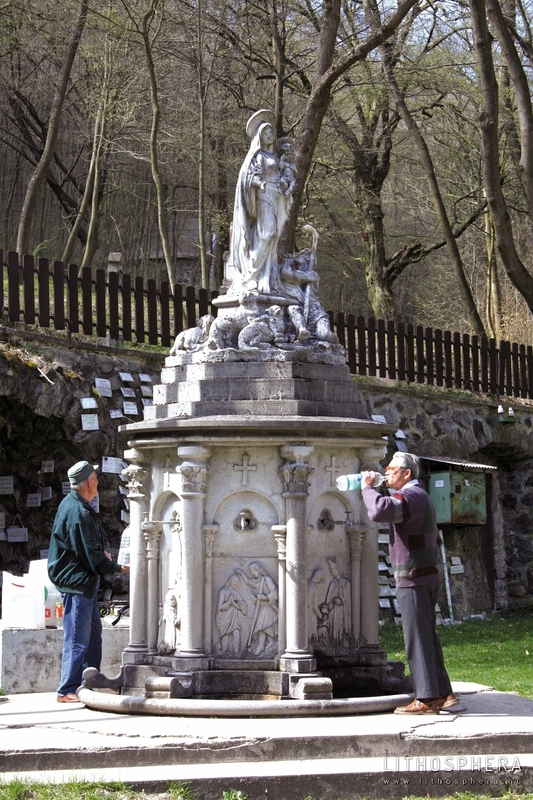 These miraculous springs, ‘saint wells’ have often become shrines as indicated by the cases of Mátraverebély–Szentkút, Karancs and Fallóskút. One of the most unique types of the natural rock features carved by mankind is the so-called ‘beehive rocks’ occurring in the greatest numbers in the Bükkalja Region. 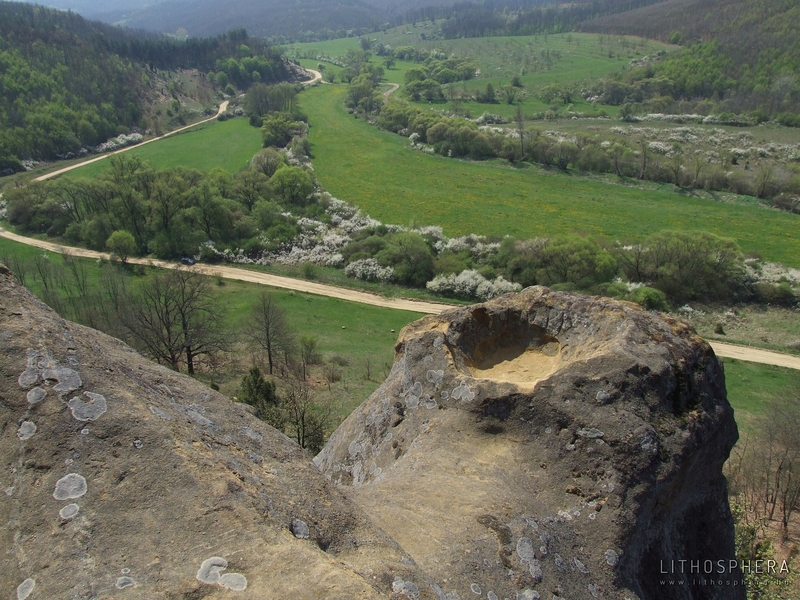 This niche rocks were called beehive rocks by the inhabitants of Szomolya, whereas they are called blank-windowed rocks at around Eger, and churn-stones, Ördögtorony (Devil’s tower), Nagy-Bábaszék (Great midwife’s chair), Nyerges (Saddler), Hegyes-kő (Sharp Rock), Kecske-kő (Goat Rock), Ablakos-kő (Windowed Rock), Királyszéke (King’s chair), Kősárkány (Rock dragon) at other places. A number of theories have been created in connection with the function and age of the niches as well as the features of the carvers and users of the niches (population, ethnic, group). According to one of them, the beehive rocks used to be tombs, and urns with the deceased’s ashes were placed to the niches. First, the carving of niches was associated with the Huns-Hungarians whereas later with the Celtic and Scythians. Another theory designated these false windows as fetish staddles and sacrifice, claiming that these mementos are from the Conquest of Hungary in age. 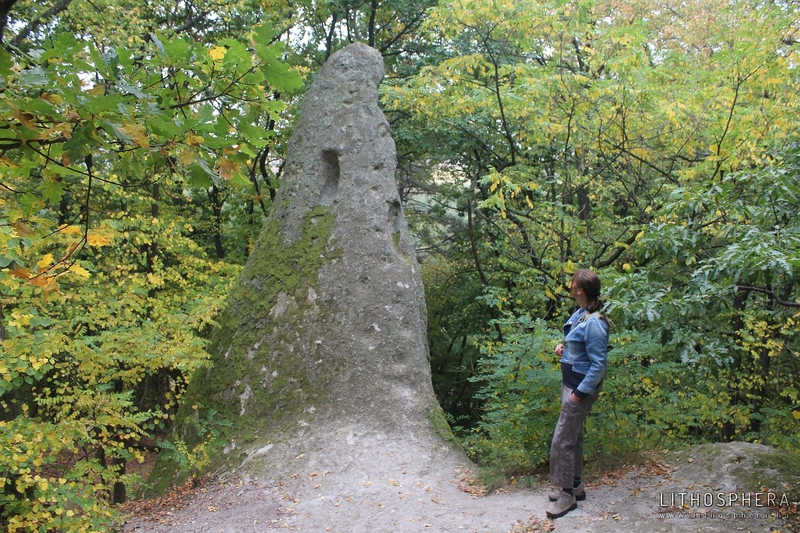 Another apprehension has become popular to the public, according to which the niches of the beehive rocks are mementos of the medieval forest rock apiculture; this kind was introduced by either the Kabars joining the Hungarians during the time of the Conquest of Hungary or by a small ethnic group escaped here from the Balkan Peninsula (Agrians). (Baráz, Cs. 2002/c). 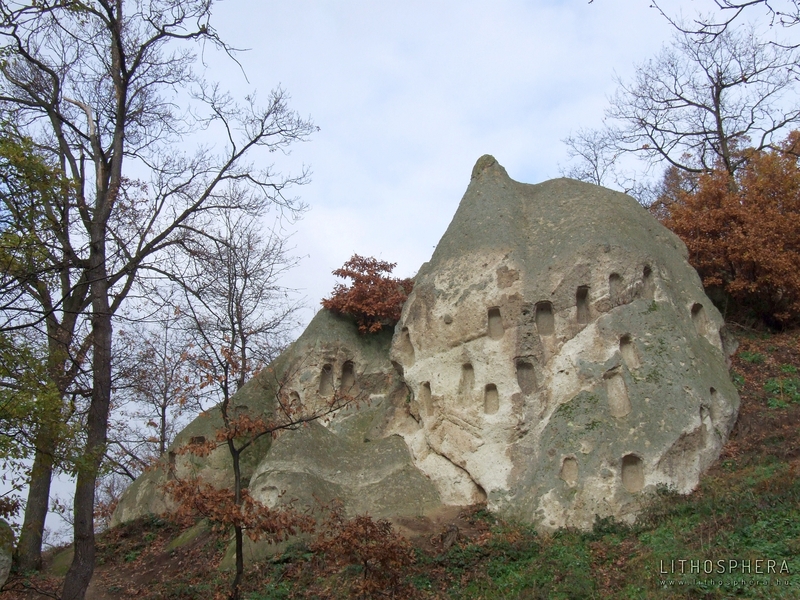 In the Bükkalja region, altogether 72 beehive rocks from 38 localities are known, and 473 niches were recorded on the rock formations. 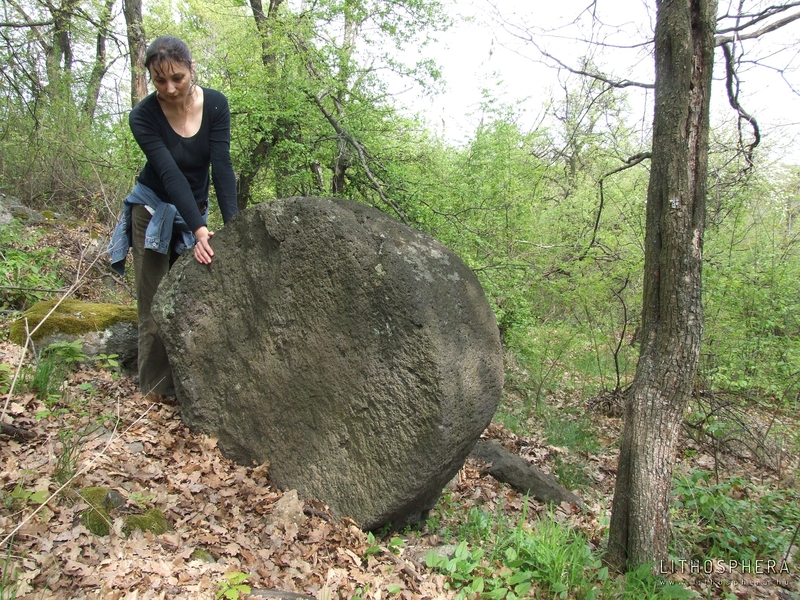 Minor groups of chambered rocks can also be found in the Pilis and Budai Hills as well as sporadically in some locations (e.g. Tihanyi Peninsula, Pécs-kő, Abaújszántó). 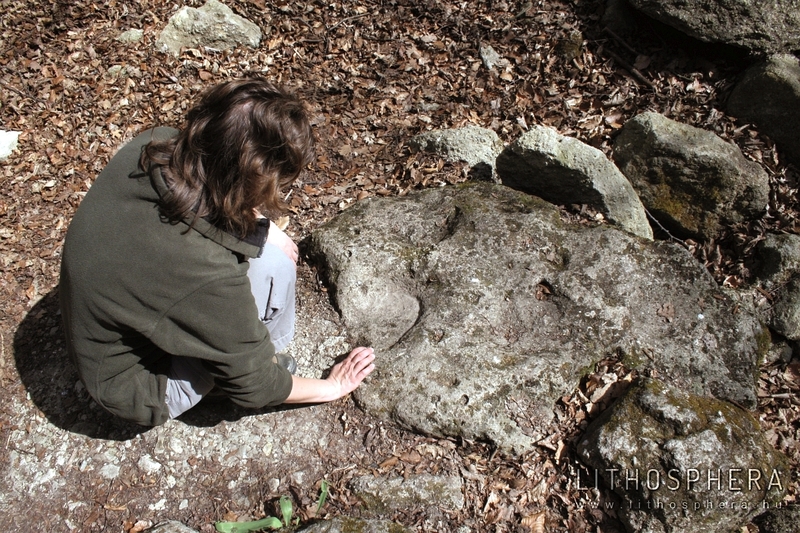 Other carved rocks can also be observed in the Mátra Forest. The Törökasztal (Turkish Table) elevated at the eastern extension of the Vár Hill of Sirok was supposedly the site of ‘pagan’ sacrificial rites; here the peak of dacite tuff was cut off and into the horizontal surface, smaller or larger basins, bowl-shaped depressions, channels and hollows were engraved. A similar function could have been attributed to rock basins carved into the peaks of the sandstone range running north of the Mátra Mountains as the so-called Kőkosár (Rock Basket) of the Nagy-Lyukas-kő above the Szent (Saint) Valley in the outskirts of the Village of Ivád. 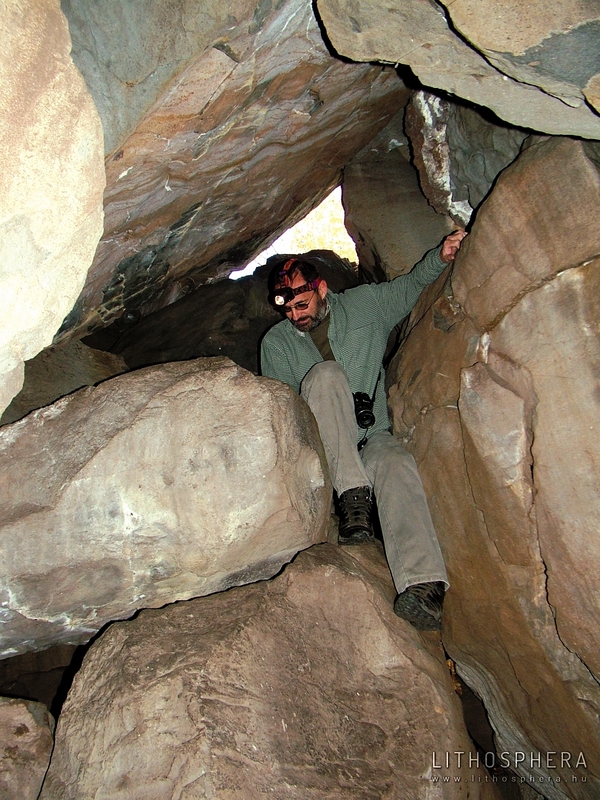 Into the easily carvable rocks, chambers associated with everyday life (‘cave rooms’, pens, cellars, etc.) as well as hollows with sacral functions (hermitages, pit ‘caves’, etc.) were deepened at many locations. 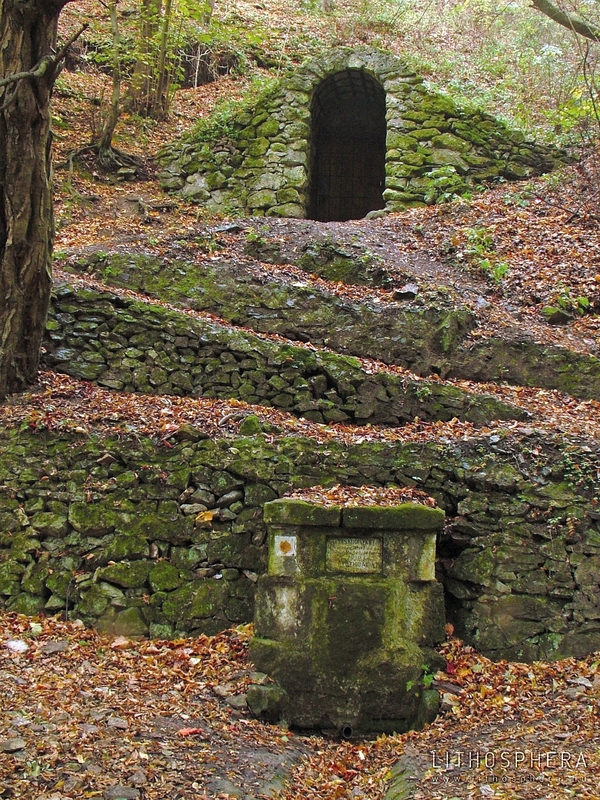 In the Mátra Forest region such are, among others, the hermitages at Mátraverebély–Szentkút, the Remete (Hermit) Cave of the Kőlyuk Hillside at Kishartyán, the Hermitage of the Szent Valley at Demjén, the Léleklyuk at Sály, the rock chapel deepened into the sandstone cliff called ‘The Vineyard of Noah’ at Istenmezeje and the rock chamber of the Nagy-Lyukas-kő at Ivád. Tunnels and cellars interlacing basically the entire region of Northeast Hungary also play an important role in legends associated with Sovereign Rákóczi in the Tokaj Mountains (Magyar, Z. 2000/b). Thus, for example, according to the myth, a cellar found in the NW hillside of the Somos of Golop, carved into rhyolite tuff, brick-arched its forefront and by today collapsed is thought to be used when the sovereign was escaping against his pursuers. Although this type is attributed to humankind’s economic activities, thus, different from the above, is classified as profane, such sites can be important parts of the cultural heritage of certain landscapes. 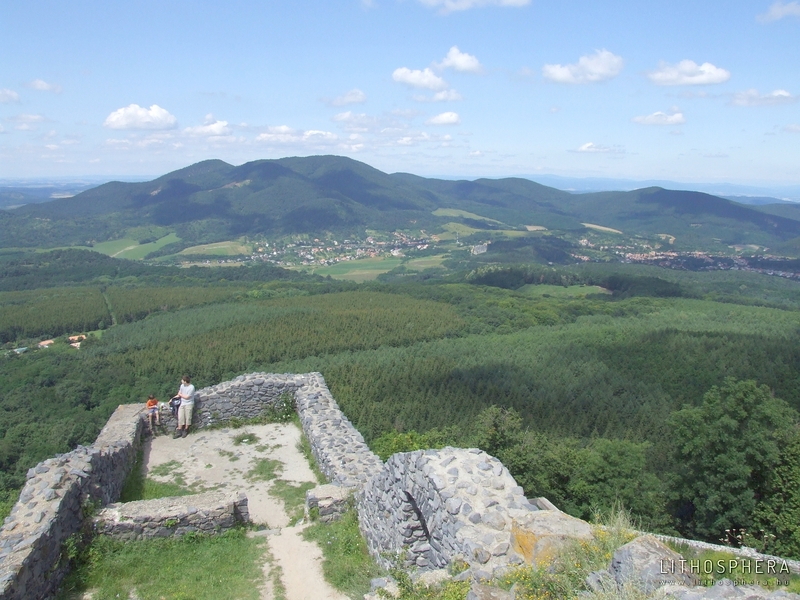 In the Mátra Forest, the Tokaj Mountains region is extremely abundant in old mining sites with most of them associated with the medieval gold mining. Shafts of the uderground mines and mementos of mining, i.e. depressions can be found in the greatest numbers around Telkibánya. Attributed to the medieval mining sites in the outskirts of Kéked, the Radácsi-kő, a large markstone with miner’s badge being a unique memento of mining in Hungary is located in the Valley of the Lapis Stream (Benke, I. 2001). Among the mining historical vestiges associated with the quarrying in the mountains, the most well-known is the Megyer Hill near the Town of Sárospatak at whose hilltop a millstone quarry was operating from as early as the 1400s. Certain occurrences of geologic formations and landforms played an outstanding role in the development of earth sciences. The best examples of this are areas from where a given formation was first described. Although this type is also classified as profane, these locations are an important part of the landscape heritage being quasi transient between the natural and cultural heritage as well. 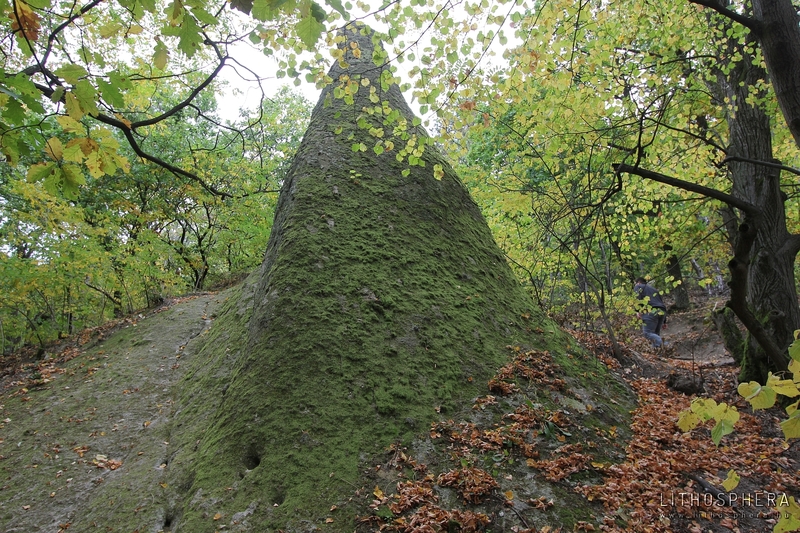 In the Mátra Forest, the occurrence of peridodite, a plutonic rock with high titanoferrite and magnetite content in the Major-árok (Major Trench) in the outskirts of Szarvaskő, is relevant from the aspect of the history of science. 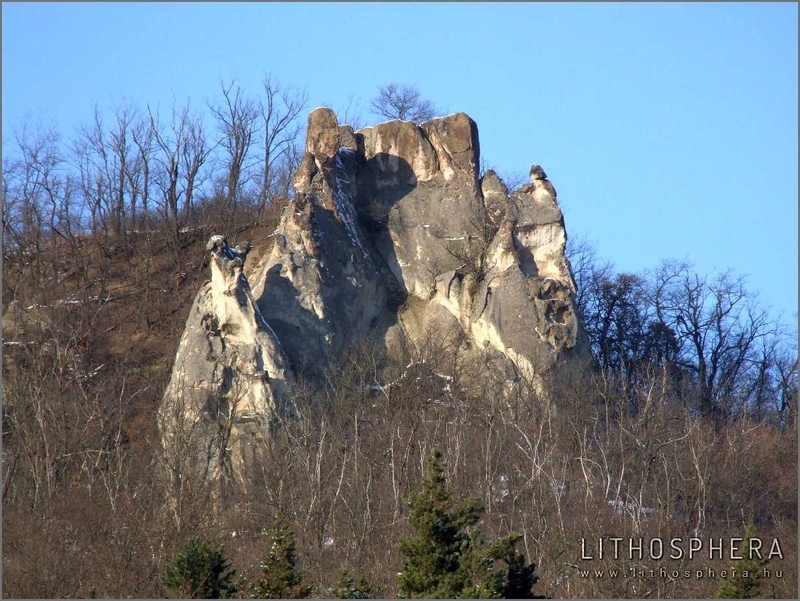 The rock called wehrlite was named after its first analyst, Alois Wehrle (1791-1835), a professor in chemistry at the Academy of Mining and Forestry in Selmecbánya (Banská Štiavnica) in 1864 (Tóth, I. 2005). At the foot of the Nagy-Kopasz at Tokaj, at the opening of the Lebuj-kanyar (Lebuj Turn), the name perlite was first applied (as Perlstein – Pearl Stone) for the rock crop out by a Danish geologist, namely Jens Esmark (1763–1839) (Rózsa, P. – Kázmér, M. – Papp, G. 2003). At many locations in the Börzsöny and Mátra mountains, rock fillings sometimes several kilometres in length are found. One of such rock ramparts connecting the Bronz Age fortress of the Kis-hegy (Little Hill) at Gyöngyössolymos with the rampart castle of Eremény-tető with a similar age is called the Lane of Devil’s towers (Bartalos, Gy. 1910). These mysterious rock fences were thought to be not only Avar age ramparts but also medieval outskirts, Palaeolithic roads ‘fairy lanes’. The road of King Szent István (Saint Stephen I) runs at the ridge of the Mátra montains: according to the legend, King Szent István lived at the castle built on the peak of Ágasvár for a longer period of time from where he pilgrimized to the church of Tarnaszentmária every day. During this long period of time, a never-disappearing narrow footpath developed in his footsteps (Bartalos, Gy. 1910). Rock dams (terraces) and rock ramparts related to vine-growing with a long history, wide-spread especially at the Tokaj-Hegyalja are also classified as profane. Certain marked stones can only be considered to be magic-cultic places only based on their names. Some of the are (recent) toponyms (e.g. Devil’ towers, Bába (Midwife) Stones, Leány (Maid) Stones) whereas others are data referring to locations appearing in written sources, local legends, old reports and maps, however either destroyed by today or not-yet-found (e.g. fetish stones were frequently referred to as early as in medieval certificates and documents of demarcation as landmarks: Kwbaluan, baluuan, Baluankuwe, Balwankew etc., in Latin statua lapidea, idolum lapideum etc.). Religious, cultic toponyms have three basic layers. One of them is the group of latent names, i.e. with unremembered meaning. Such include Tarna and Darnó (geographical names with the root ‘tar’, ‘dar’), Sár Hill and Szár Hill (geographical names with the root ‘sár’, ‘szár’), the Ság Hill, the Somlyó and Dobogó toponyms. To this latter one, the example will be described below. The second layer was preserved by the pre-Christianity religious remembrance. The last, third layer is composed of geographical names formed from the church and cult historical vocabularies. Some examples of the latter two groups from the area of the Mátra Forest are: Áldozó (Sacrificer) Meadow, Well, Stream, Castle; Bába (Midwife) Stone, Seat, Hill, Valley; Bálvány (Idol); Barát (Friar) Crag, Hill, Valley, Meadow, Spring; Imó Stone, Crag, Stream, Valley; Ördög Bank, Pit, -kő (Rock), Plain, , Hillside, Valley; Szentlélek Valley, Hilltop etc. 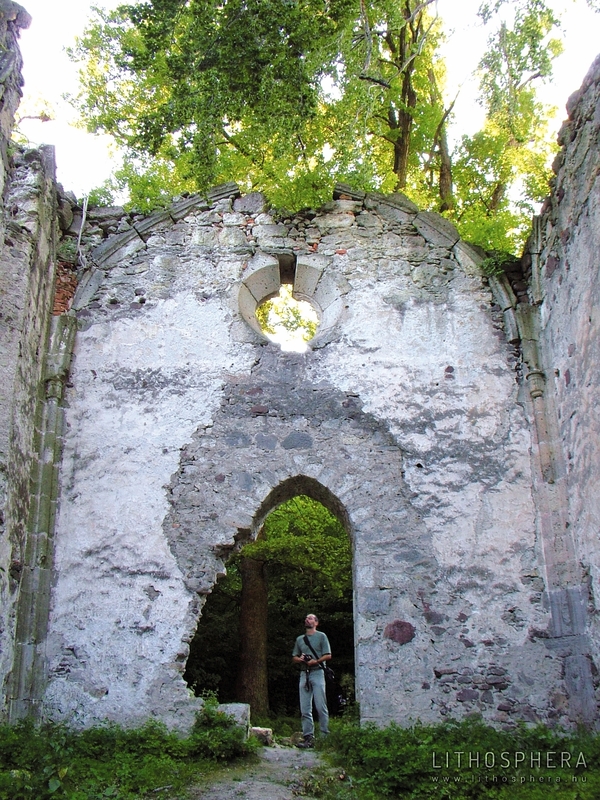 In the Mátra Forest, a number of Pauline friary and ruins of cloisters are found in whose neighbourhood the geographical name ‘Dobogó’ (beating) is also observed. The connection, context is obvious, however regarding its cause only hypotheses leading to spirituality and metaphysics are available (Baráz, Cs. 2002/b). North of the Town of Eger, in the valley under the Dobogó Crag at the outskirts of Szarvaskő, ruins of the Pauline monastery of Almár can be found. In the eastern rim of the Bükk Mountains, not too far from the Castle of Diósgyőr, once also stood a Pauline friary to which southeast the geographical name Dobogó also occurs (at Csemőke near the Avas). 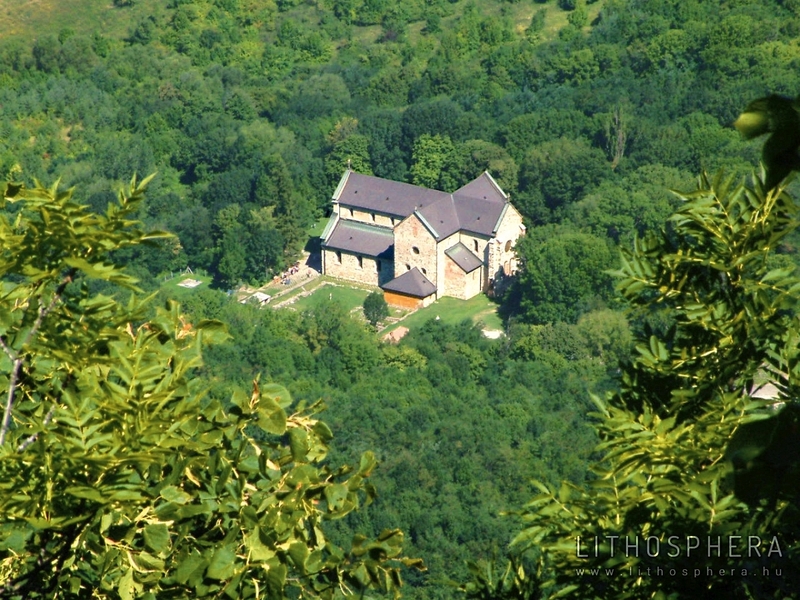 The Dobogó toponym coupled by a Pauline monastery is also found in the Mátra Mountains: the cloister of the Pauline convention existing until the 16th century is presumed beside the still-standing chapel in Mátrafüred, at the foot of the hill called Dobogó. The Pauline-‘dobogó’ couple (or, to be more precise trio) is also found in the Börzsöny Mountains: this includes the Pauline monastery of Márianosztra with its attribute, the so-called cloister of Toronyalja and the Dobogó Hill at the northern part of the mountains. 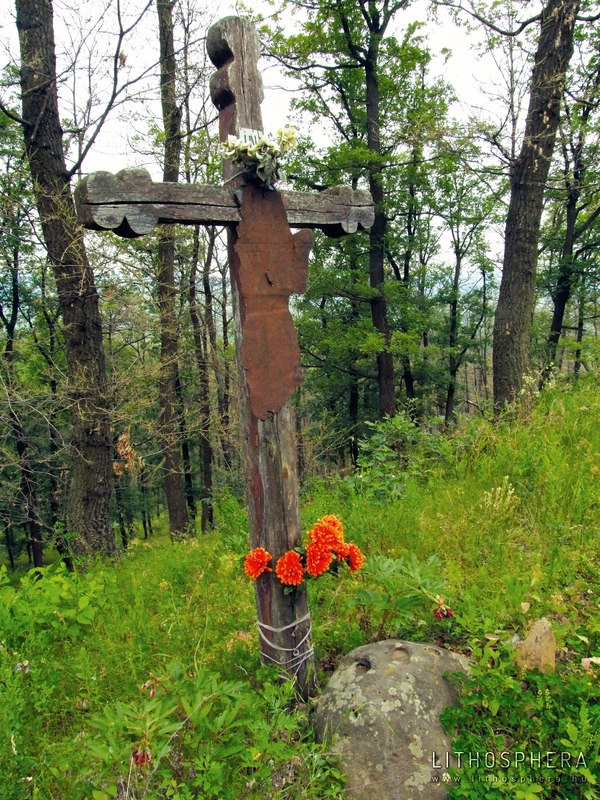 In the eastern corner of the Mátra Forest, in the Tokaj Mountains, at present three Pauline monastery – Dobogó toponym couples can be documented. The Pauline monastery of Gönc is found under the Dobogó Hill in the valley of the Kis Stream. To the east, the northeastern side of the Magas Hill with an elevation of 514 m and being the northern member of the Sátor Hills is also named Dobogó, beneath which stands one of the oldest Pauline monasteries of Hungary, within the Town of Sátoraljaújhely. Above the Pauline cloister of Tokaj, at the margin of the settlement the toponym Dobogó can also be observed. The types mentioned above are unevenly distributed in the landscape. There are landscape units, geographical locations where myths and the sacral heritage reveal a particularly close texture, and thus their impact extends beyond the living-space of the community creating the local heritage of legends. These geographical locations bearing a rich heritage and sanctified by folklore, visions, Virgin Mary revelations, miraculous events and recoveries have typically become pilgrim places or shrines. (Bálint, S. – Barna, G. 1994). Around the renowned pilgrim places or places of worship attracting great masses, in the course of time, a so-called sacramental landscape was organised. A sacramental landscape surrounding essential places is an area from where pilgrims regularly visit the pilgrim place and to the border of which the spiritual power and influence of the place of worship is exudated. Living in the sacramental landscape, belonging to the place of worship developed some kind of community consciousness (Hoppál, M. 1990). 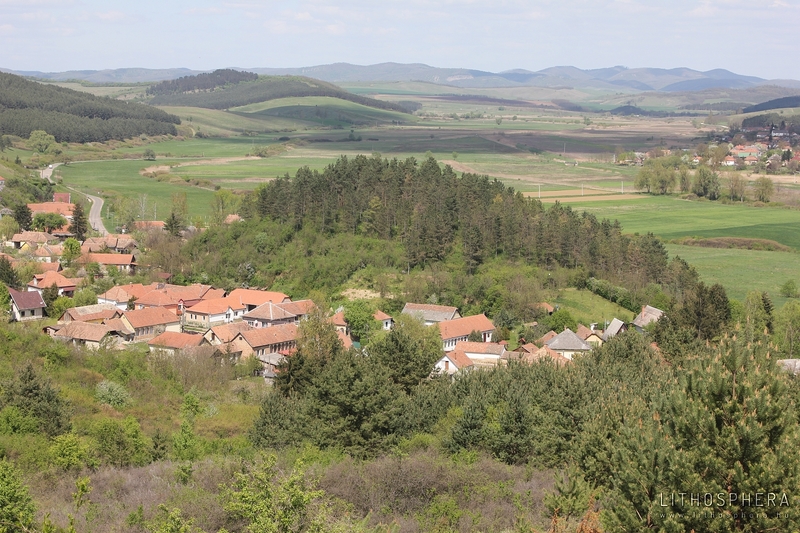 From the area of the Mátra Forest, three essential places (sacramental centres) are mentioned here as examples. Mátraverebély-Szentkút –, with the canyon-like valley formed after the jump of King Szent László (Saint Ladislaus I), a rock with footprints and a ‘magic well’ (miraculous events, recoveries, visions, revelations related to the spring) –, is a holy place still actively functioning today (Bálint, S. – Barna, G. 1994, Baráz, Cs. 2002/b). A sacramental centre of the landscape slowly losing its activity is the Bél-kő at Bélapátfalva, with the karst spring at its foot (Mária (Virgin Mary) Spring, ’Bélháromkút’, i.e. ’Trium Fontium de Beel Cumanorum’) and with the medieval Cistercian Monastery built there (Baráz, Cs. et al. 2003). Also, several legends are connected to the Pogányvár (Pohanský hrad) at Óbást (Stará Bašta), where, in addition to a group of rocks with bizarre form, the János Ördög Rock, the cavern networks, formed in basalt and also representing an outstanding value from the point of view of the earth sciences, also moved the imagination of the people living in the surrounding areas. The vicinity’s sacral character is further enhanced by a cultic place of local significance, the shrine of the Básti Hill that might be regarded as a filiation of Mátraverebély-Szentkút. The district of Pogányvár is made to be one of the essential noted places of the Mátra Forest by the magic well (a health-giving spring) in the canyon between Egyházasbást (Újbást, Nová Bašta) and Vecseklő (Večelkov), by the Virgin Mary’s revelations there as well as by other transcendent phenomena and legendary myths (Barna G. 1980, Magyar, Z. 2006). The world of myths is often focused on historical personalities (Magyar, Z. 2006). 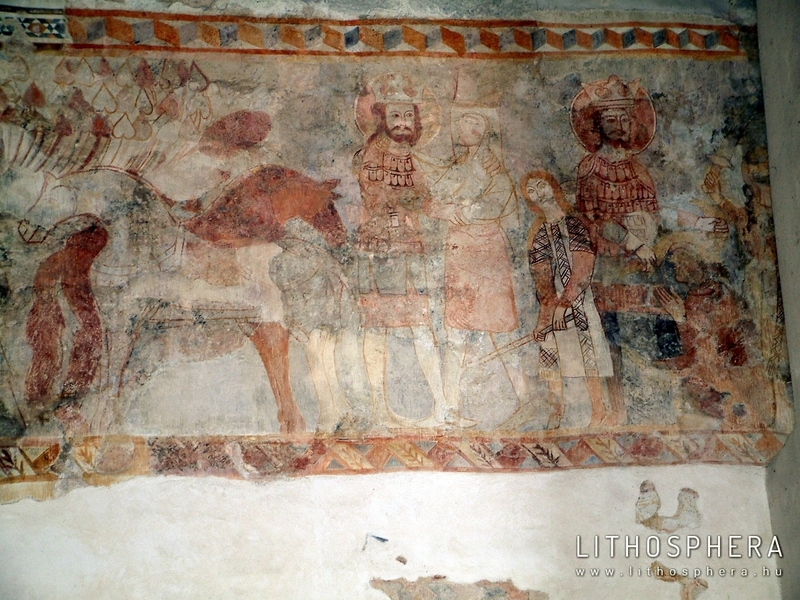 Dominant and popular heroes of legends present in the Carpathian Basin are Attila the Great King of Huns, Kings Szent István (Saint Stephen I), Szent László (Saint Ladislaus I), Béla IV and Matthias Corvinus (Magyar, Z. 2000/b, 2006). Among the certain geographical meso-regions, ethnographical regions including the area of the Mátra Forest, variations can also be found. The base layer of geographical myths attributed to historical personalities in Palóc Land starts with Attila the great king of Huns, complemented by King Sámuel Aba and the kings of the Árpád House. The question regarding the location where the grave of Attila (Atilla, Atyl, Etele) the latest great king of Huns was asked tons of times. In order to own the location for the tomb of Attila, there has been and is a competition among all regions of the Carpathian Basin and a number of settlements of Hungary. No satisfactory answer has been yet given on questions regarding the burial place by scientific research. Nevertheless, several geographical names canonized by the person of Attila, such are the Nagy-halom at Szajla or the Szádelői Valley (Baráz, Cs. 2001, 2002/d). The Hungarian king Sámuel Aba (†1044) was born in the region and is a relevant personality of the local world of myths. The three ‘Kuman’ (Cumanian) tribes settled in the area of the Mátra Forest were led by the Aba, Bors (Borsu) and Örsur (Vrsuuru) kins. A large land was donated to the Aba kin in the region’s area west of the Eger Stream: according to Anonymus, this area was intended to be donated by Sovereign Árpád to the ancestors of this kin, namely Ed and Edumen. Many legends are attributed to King Sámuel Aba, such are the myths of Aba Rock and Aerated Spring (‘Csevice’) of Tar, among others (Kandra, K. 1891, 1897). Most myths related to King Szent László (Saint Ladislaus I) can be observed in the Abaúj-Torna region (e.g. Szádelői Valley, Debrőd, Szepsi), in the County of Nógrád (e.g. Mátraverebély-Szentkút, Karancs) and the Mátra Mountains (e.g. Szent László Spring). Legend connected to King Béla IV can be traced from Muhi, across the Bükk Region (Bélapátfalva, Járdánháza), Upper Hungary and the Transdanubia to Croatia, i.e. 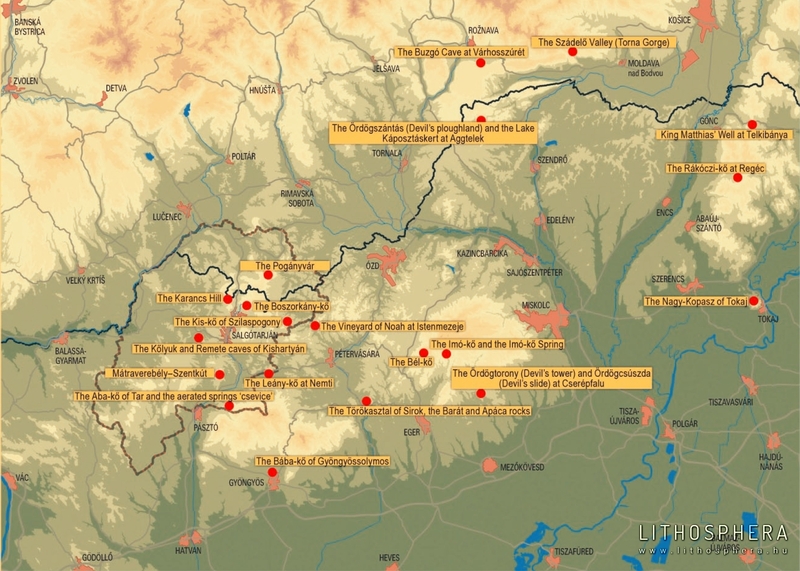 at many locations in the king’s route of escape against the Tatars and its environs. 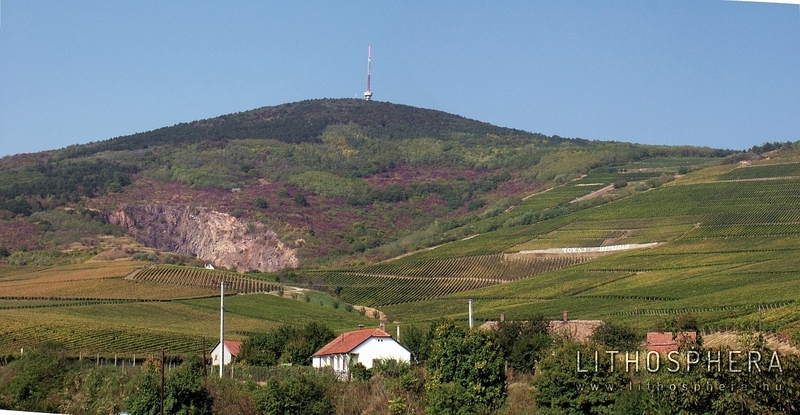 In the Tokaj Mountains, the most frequent theme is the personality of Soveregin Ferenc Rákóczi – the sovereign thousand-fold joined to the region is perpetuated by several spring wells and horseshoe-marked rocks (e.g. the Rákóczi-kő of Regéc). Myths linked to Kings Szent István (Saint Stephen I) and Mátyás (Matthias Corvinus) show a more even spatial distribution which can be found at many locations in the Mátra Forest similar to other region’s of Hungary. In relation to historic events, more frequent occurrences can also be observed (Magyar, Z. 2006). Such are in the Carpathian Basin, thus also in the Mátra Forest, in Palóc Land, the escaping of King Béla IV following the defeat at the battle of Muhi or the battle of King Szent László with the Cumans. In this chapter, examples of marked stones and places of fable from the area of the Mátra Forest will be introduced. In the area of this landscape unit extremely rich in locations with several earth scientific values and similarly abundant world of legends, while carrying out selection due to the extension limitations, the authors intended to give an introduction on locations being valuable both from the point of view of earth sciences and cultural history or has a nation-wide relevance form at least one of the aspects mentioned. A review of the regional focal points and essential places of sacralising legends was also thought to be important. Our intention was to introduce some examples for all types represented above. The earth scientific and cultural historical relevance for all locations will be reviewed followed by the introduction of nature conservation. 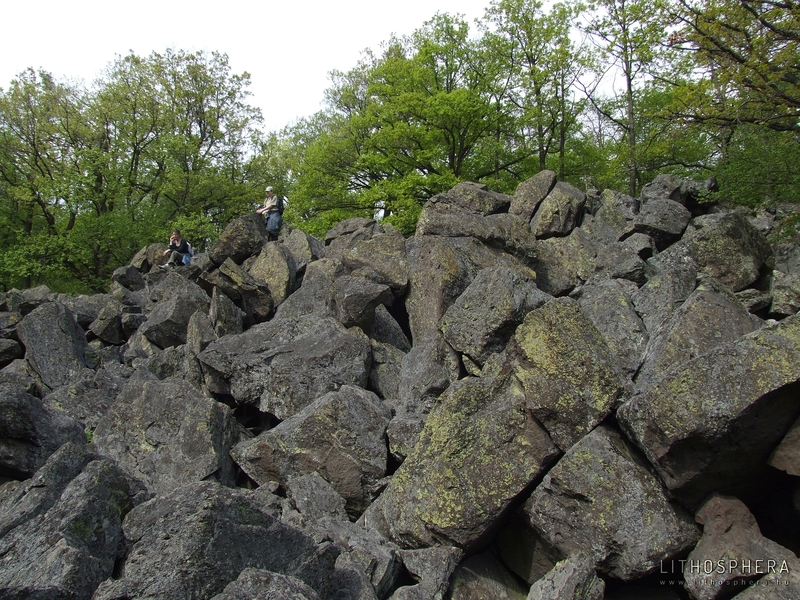 The andesitic lava rocks and pyroclastics of the Mátraverebély–Szentkút area (Mátra Volcanite Group of Formations) located at the eastern part of the Cserhát Region formed during the volcanic activity taking place in the Badenian stage of the Miocene, i.e. 15-16 million years ago. Into the soft tuffic rocks, deep, locally gorge-like valleys were cut; one of them is the Szent László Gorge. On the volcanic rocks, during the sea transgression following volcanic activity, Lajta limestone (Rákosi Limestone Formation) being rich in fossils was deposited. At the southern side of the Meszes Hill, in the layers with a more sandy facies of the sedimentary rock hermitages whereas at the western side, the Betyár Cave are deepened (Prakfalvi, P. 2004). 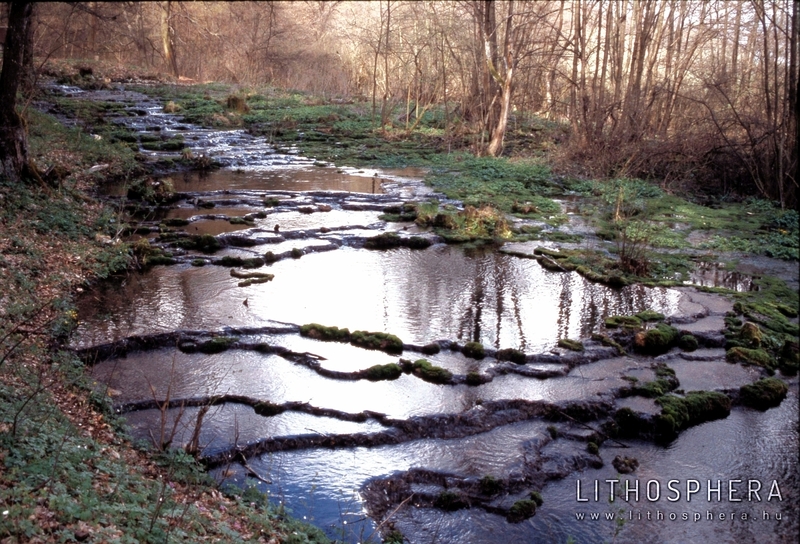 At the contact of the andesite pyroclatics and Lajta limestone (‘Layers of Szent László’) the Szent László Spring rises. 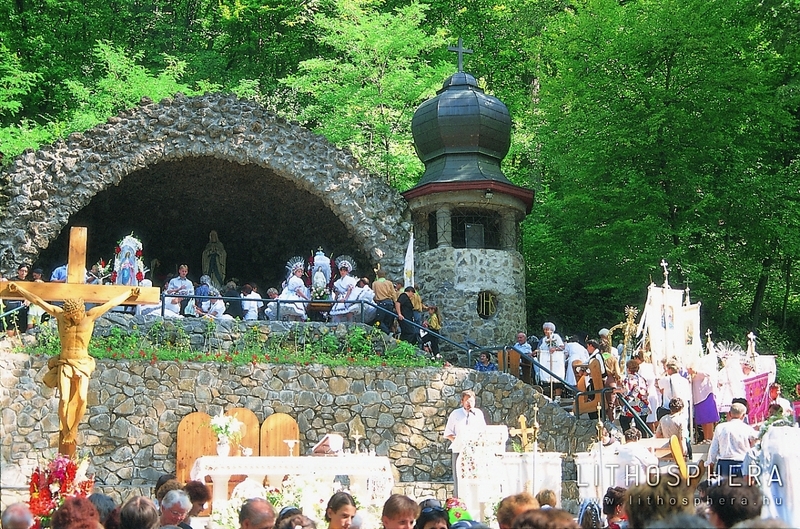 At the ‘sacred centre of the world’ of the Mátra Forest, at the place of worship of Virgin Mary with nationwide fame, in Mátraverebély-Szentkút, a rich world of legends has been preserved. 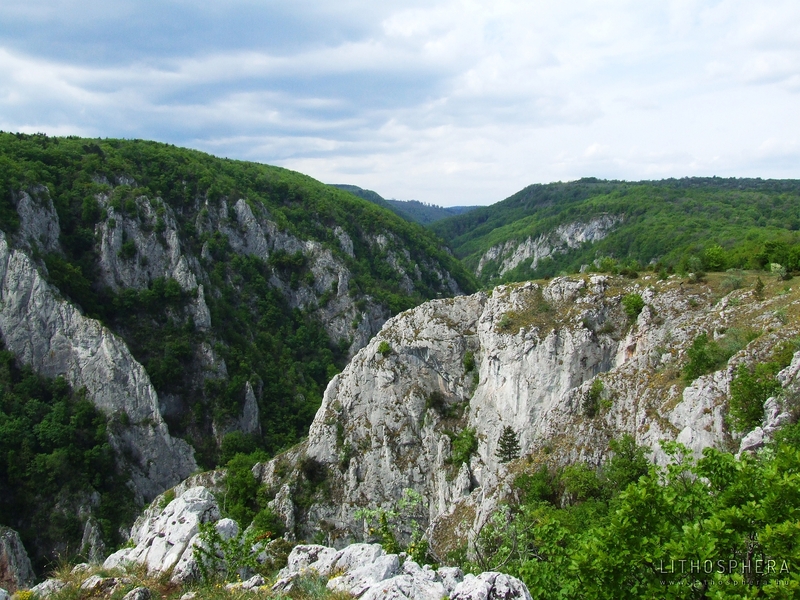 One of the gorge-type valleys cut into the hillside, the Szent László Gorge, according to one of the myths, formed as after King Szent László escaping from the ‘Tatars’ (Cumans) coming upon hum the ground opened and the pursuers fell into the abyss. In another version, the ground opened in front of the king that was leaped over by his horse (steed horse) while the ‘Tatars’ met their deaths in the abyss3. During the leaping “…the rock into whose side the horseshoe was deeply carved was shaking. This marked and marks forever that in for God, there is no impossibility” (Chinorányi, E. 1929). The horseshoe imprint was seen by György Misleniczky, Pál Balassa’s steward of estate in 1721 to be in such a good shape that even the points of the horseshoe nails were traceable (Chinorányi, E. 1929). According to the myth, the spring rising at the valley floor was wringed by King Szent László (Saint Ladislaus I).4 Three versions of legends on the origin of the sacred well is known. According to the first, the spring rises from the hoof- or shoe-print of King Szent László’s horse after his leaping; as by this, the king was jumping his horse from Ágasvár (Borovszky, S. 1911, Szendrey, Zs. 1921), from the Karancs Hill (Fejős, Z. 1985) or from the Castle of Fülek (Magyar, Z. 2006) to Szentkút. By another version, the king wringed water by sticking or cutting into the rock with his sword, axe or pike by this rescuing the soldiers sweltering from thirst from perishing (see the leaping of King Szent László and the miraculous wringing of water). According to the third version, the spring evolved as a result of the king’s petition, prayer. The spring of the Szent László Gorge is still called Szent László Spring. At the spring, later Virgin Mary also appeared with Little Jesus on her hands since when a long series of miraculous recoveries by the spring water is originated. The exact time of the first physical recovery can not be estimated, it is presumably happened between the death of King László (Ladislaus I) (1095) and his canonization (1192). This legend was written down by Márton Lukovics vicar of Kisterenye in 1714 (see The miraculous spring of Szentkút). According to another telling, when a dumb swain got thirsty and was looking for water, Virgin Mary appeared for him in the greens of the woods and pointed out a horseshoe-shaped depression. The lad drank from the spring water due to which his voice could be heard. The apparition was happily told to his father who could hardly believe what he heard. His father started to enlarge, deepen the small spring; this is how today’s Szentkút is originated (Chinorányi, E. 1929, Zadravecz, I. 1934). Other versions mention that the stories above focus on the character of King Szent István (Saint Stephen I) jumping his horse from either Ágasvár elevated at the further side of the Zagyva Valley (Kálmány, L. 1891, Szabó, K. 1854) or the Karancs Hill (Pápai, K. 1891) to Szentkút. It is supposed that the character of the king founding Hungary was the original (Magyar, Z. 2000). Written data is available on Imre Vereb living at his estate in Szentkút in 1231 in accordance with the norms observed by Hermit Szent Pál (Saint Paul). Later, the hermits carved chambers into the soft rock of the Meszes Hill, among which two were used as chapels whereas the rest served as ‘dwelling caves’. The last hermit of Szentkút died in 1767. Thus, at the marked location of Mátraverebély–Szentkút, a multi-layered world of legends and a transcendental group of phenomena have evolved around which a shrine was organised as early as the 18th century. At the site of the former pilgrim church, a Baroque church (‘basilica minor’) and monastery was constructed in the second half of the 18th century. The main saint’s day of the national place of worship is held on the Feast of the Assumption (on 15th August). The area, at present, is not protected by law, however the declaration procedure, under the name Meszes Knap of Mátraverebély Nature Conservation Area is in process. The vertical rock wall of the Kőlyuk Hillside at Kishartyán 300 m in length and typically 30–40 m in height is composed of sandstone formed in the Oligocene and Lower Miocene, about 19–23 million years ago (Pétervásárai Sandstone Formation). 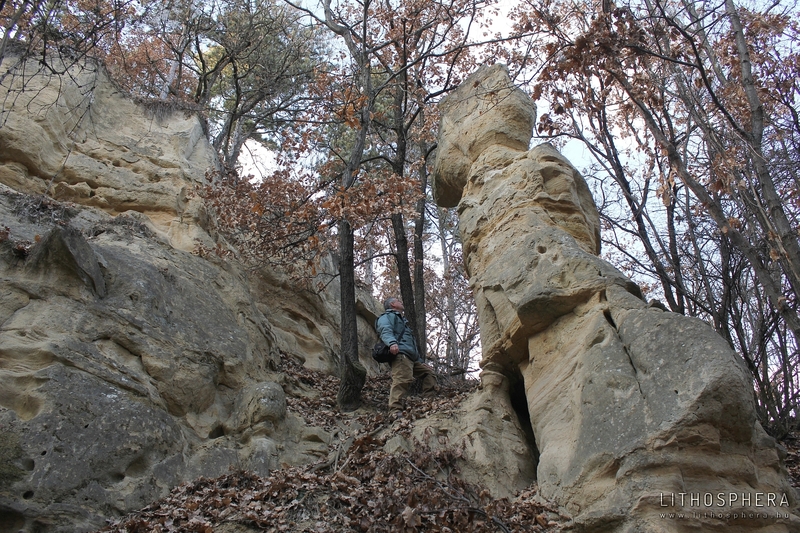 The exposure demonstrates the sedimentary cycles of the sandstone in two different sections separated by a minor fault. The 17 m thick eastern rock wall is composed of well-developed cross-bedded sediments. Upward, grain size decreases from very coarse to medium-grained sandstone with this, certain layers collaterally thinning out. The western wall is composed of layers thinning and becoming coarse upward. Of the surrounding loose sediments, the sandstone was weathered out resultant from the impacts of external denudation forces, primarily rainfall, wind and frost shattering, in the form of spectacular rock walls. The Kőlyuk or as also known, Remete Cave being the eponym of the rock wall opens at the upper third section of the sandstone wall. Presumably, this dwelling cave was deepened here by the artificial expansion of natural hollows occurring in great numbers in the rock, formed by weathering. 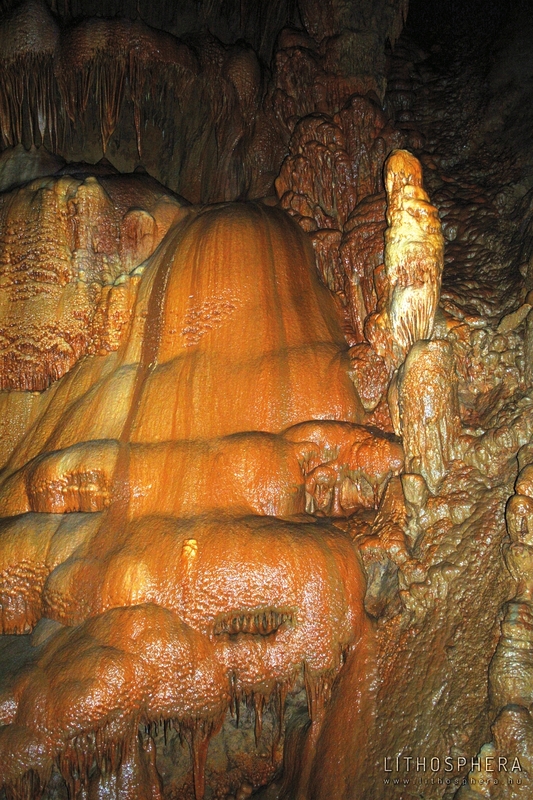 The total length of the hollows in the Kőlyuk (Remete Cave) formed by the extension of natural hollows is approximately 16–17 m (Márton, F. 1996). 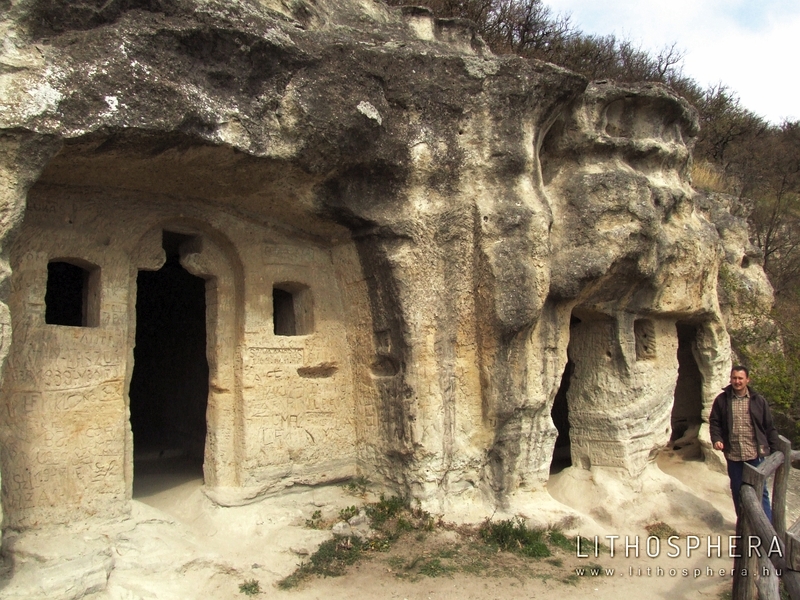 The trigeminal dwelling cave during the conquest of Tatars and the Turkish occupation provided shelter to the residents of the region, later was inhabited by hermit friars until the end of the 19th century . It could be approached from the valley floor on steps carved into the rock wall as well as another route of escape with handholds was found toward the knap. According to the legend, the original site of settlement was under the rock wall and was destroyed during a landslide. At the edge of marshland, the resident population cherished a willow-tree, as by them, growing at the site of the buried church, for a long time. The area named Kőlyuk Hillside of Kishartyán Nature Conservation Area is protected by law on local level. The Karancs Hill, or as named by Noszky J. sen. (1912), the ‘Palóc Olympos’, is one of the most typical occurrences of subvolcanic laccoliths in Hungary, an object-lesson represented in school-books. It was formed during the Badenian stage of the Miocene, approximately 15 million years ago when into the Oligocene-Miocene sediment overlying the area, igneous rock masses andesitic in composition intruded from the depth. The hot magma however did not reach the surface but was stagnated in a near-surface stage hogging sedimentary layers. The magma’s intrusion took place periodically thus the Karancs Hill is basically a ‘multi-layered’ system of laccoliths, a series of juxtaposed and superimposed laccoliths. During the approximately 15 million years since the intrusion of the igneous rock mass, the overlying sedimentary sheet was mostly denudated from the rock masses stagnated under the surface and the laccoliths or at least their top sections were weathered out. Such weathered laccoliths were elevated by the tectonic movements taking place at Late Pliocene and Pleistocene by a few hundred meters relative to the surrounding hill-county, thus the Karancs Hill, making up a tergeminal range, is elevated with a level difference locally exceeding 500 m compared to its environs. The water of Tarác Well at the Karancslapujtő side, a health-giving feature is attributed that is acknowledged by several miraculous recoveries (Lengyel, Á. – Limbacher, G. 2007). The sacred well was also a ‘seedy well’ where in order to increase the water’s curative impacts, the clothes used for towelling were hanged onto the nearby shrubs and trees, basically also leaving their illnesses behind. Home-folks when there was rainbow, went to the ‘medical well’ to wash their diseased organs. The spring was, according to the legend, named after a hermit called Tarác. 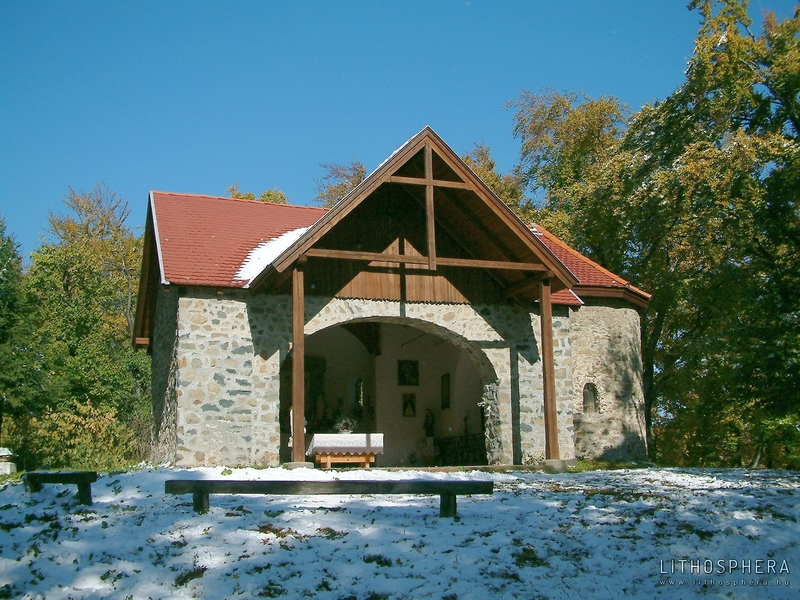 The chapel of Karancs Hill at Karancslapujtő is a significant shrine just as the tiny Mária (Virgin Mary) place of worship called Szentkút at Karancsság where annually two services are held: one on the last Sunday of May and one on the Sunday close to the Feast of Our Lady of Mount Carmel. 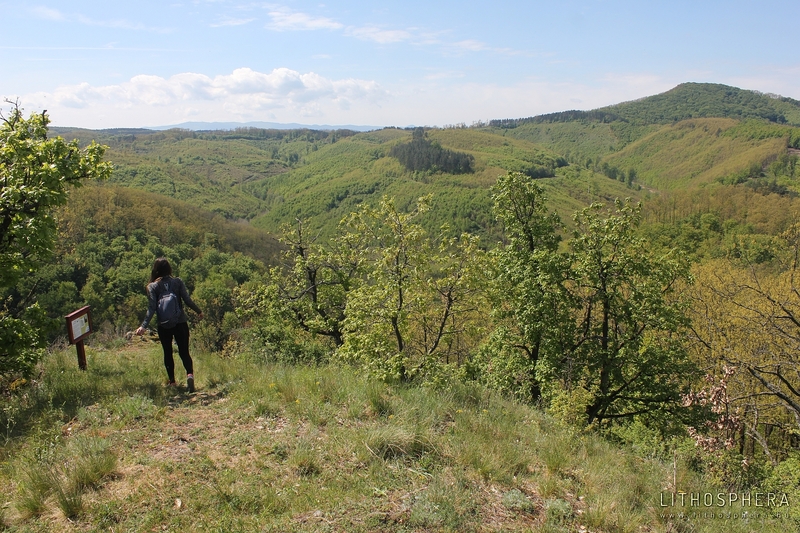 This hill is, under the name Karancs–Medves Protected Landsape Area, protected by law and is managed by the Bükk National Park Directorate. The Boszorkány-kő (Witch Rock) also known as Kis-Salgó (Little Salgó), similar to the other volcanic formations of the Nógrád–Gömör basalt land, e.g. Somos-kő, Medves, Szilvás-kő and the adjacent Salgó, were formed in the Pliocene as a result of basalt volcanic activities, in the second stage of the volcanic cycle, ca. 5.5–3.7 million years ago. At the beginning of the volcanic activity, along with a fissure with a NNW-SSE dipping fissure, explosive-type eruption took place during which various sized pyroclastics were piled up with great masses of inclusions from the seat rock (sandstone, variegated clay, rhyolite tuff). Following this, the lava intruded upward along the fissure, filling in the longitudinal chamber. Consequently, the hill indicates the morphology of an elongated ridge peaking in a three-parted hilltop. 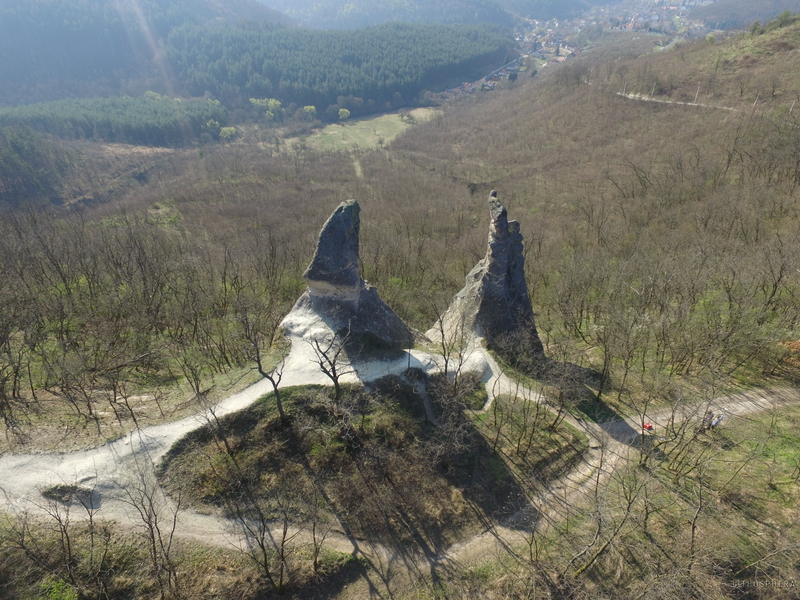 The scientific relevance of the Boszorkány-kő is given by the occurrence of nearly all eruptive rocks including basalt tuff disseminated bombs and lapillis, slaggy basalt and lava rocks, thus the stratovolcanic structure can be well-studied. In the top level, among the various forms of occurrence of lava, the slightly dipping thin-laminated basalts separated by ’escarpments’ some cm-s in size at the southern main peak with an elevation of 572 m above sea level as well as the scenically arched ordinate columns making up the southern wall of the northern ’peak’. A particular phenomenon is the so-called corn cobness: the ’contaminated’ surface of lava rocks is a result of the exfoliation of small, ball-shaped pieces from the basalt surface by the impact of tensions within the rock resultant from the Sun’s irradiation, due to which the rock, as mentioned by local miners, ’got sunstroke’. The flat-topped hill represents the site for the dance of the witches in the folk imagination. Another story tells that Aunt Mari (nickname for Mary) living in the village below was thought to be a witch and after she was chased away by the country-folk, she lived her life in the cave beneath the rock. 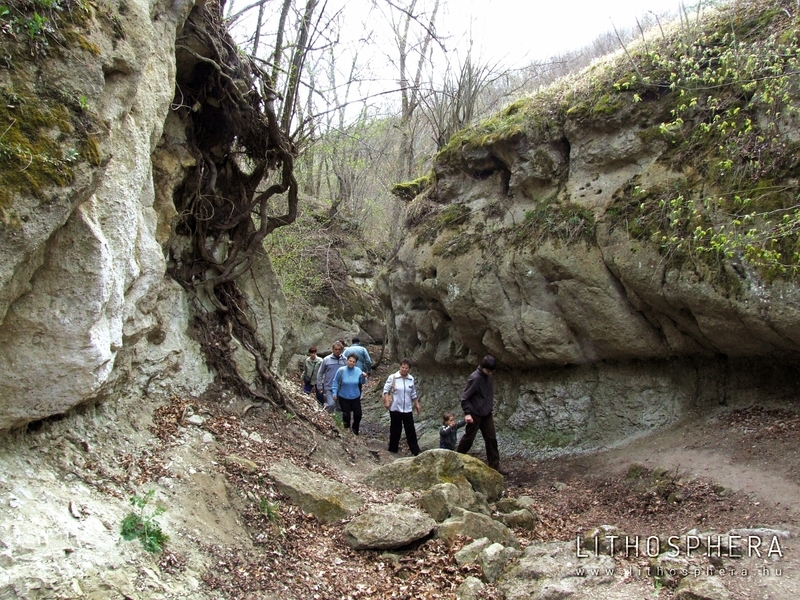 It is since the rock is called Boszorkány-kő and the small hollow is named Mari-nene-lyuka (Kovács B. in: Frics Gy. 2007). The area, as part of the Karancs–Medves Protected Landsape Area, is under nature conservation protection and is managed by the Bükk National Park Directorate. The Pogányvár (Pohanský hrad, Pagan Fortress) evolved in the second phase of the Pliocene volcanic activity in the Nógrád–Gömöri Basalt Area, approximately 4.7 million years ago (Prakfalvi, P. et al. 2007). Volcanism began with tuff-scattering followed by basalt lava flowing onto the surface. The basalt plateau is made up by the flat surface of a lava sheet with an extending to an area of 600 x 800 m and elongated to a NW-SE direction. The location of the former volcano’s crater is indicated by a volcanic neck filled in by basalt below the plateau’s south-western edge being the plateau’s highest point (578 m) still today. Basalt sheet is the thickest here being approximately 35 m slightly thinning to northward. This neck extending to an area of 100 x 150 m is, on the surface, surrounded by a blowing cone built up of basalt bombs and porous lava shreds has remained in a width of 200 m and is elevated above the surrounding plans by a 6–10 m level difference. The cone’s softer rocks were mostly prevented from being denudation by the lava flowing around the blowing cone even though its south-western part was totally eroded. Here, basalt blocks slipped down to a shorter or larger distance on the slopes can still be observed. Among them, one of the Pogányvár’s most well-known rock formations, the János Ördög Rock is included. From the lava sheets at the northern part, two major lava flow offshoots remained: the Erős-ág 750 m in length running northward and the 400 m long Pósa Hill (Posa) trending to a north-eastern direction. Especially the former is spectacular with its surface being at the opening section made up by a 180 m wide flat plateau followed by the lava flow gradually narrowing to a hardly some meter wide rocky ridge at the end. The Pogányvár is the most untouched basalt plateau of Central Europe. The lava sheet was disrupted by only one single abandoned quarry; however the resultant scar has been by now almost perfectly removed by nature. 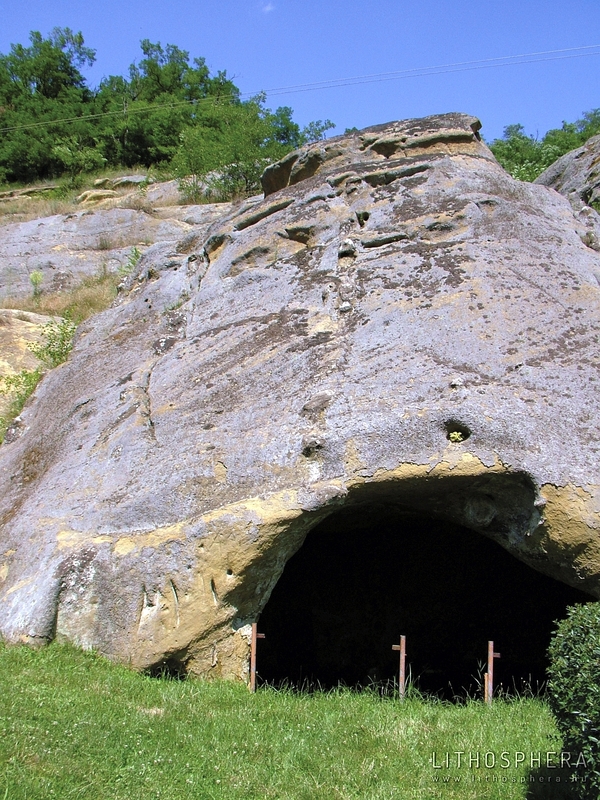 The remarkable geosites of Pogányvár are caves with non-karstic origin (Gaál, L. et al. 2007). At present, 31 basalt caves are registered, most of which are developed as a result of gravitational slope movements at the edge of the basalt plateau. At the fringe of the basalt massif uncovered following the erosion denudation of the adjacent sandstone, as a consequence of the tensile stress fissures formed. They were later covered by the falling blocks at some locations, creating closed chambers. Between the basalt massif and the fallen blocks in a distance of few meters, several parallel fissures could develop as well as a more extensive underground system of passages could be shaped. Due to the tension stress, fissures also developed in the slipped basalt blocks themselves and, after the complete decomposition of bulks, the resultant immense blocks encaved usually chaotic, often labyrinth-type chambers. Among the caves, the largest one is the Oszlopos (Columned) Cave (Stĺpová jaskyňa), with the total length of its passages being 182 m. One of its most significant hollow natural in origin known for the longest period of time is the Labirintus (Maze) Cave (Labyrintová jaskyňa) whose complicated passage system is 151 m long. The mysterious hillocks and rock wall remnants of the Pogányvár elevated above the villages of the Medvesalja region, the bizarre shaped rocks at the plateau’s margin and its caves meandering in depths made a contribution to the survival of several epic legends. According to some theories, among the hillocks of the basalt plateau, presumably formed by mankind, once pagans, hiding from the Christian conquerors, sought shelter. Folk notion links the origin of the János Ördög Rock to the appearance of pagans and accounts that this formation resembling the shape of a human being carved by themselves in order to recruit their belief and was idolized by cultic adoration (Magyar, Z. 2006). 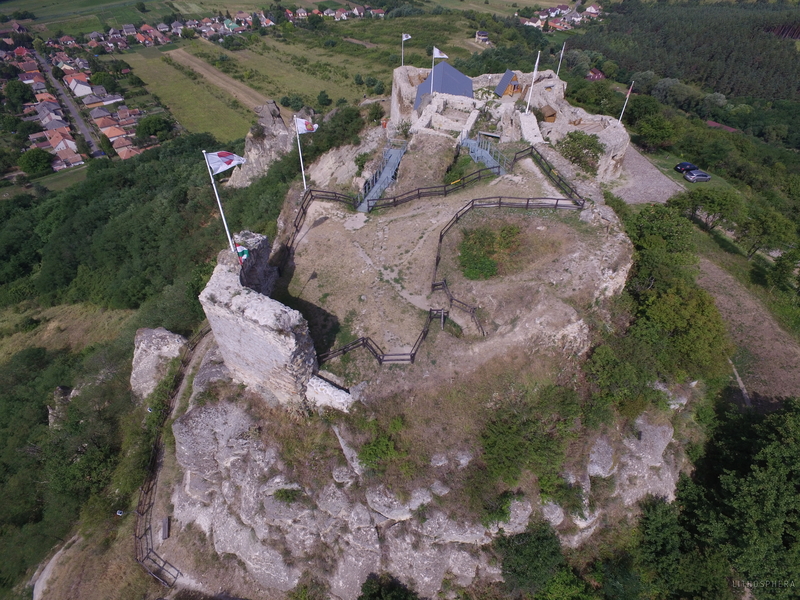 According to a legend using another source, the Pogányvár „is named after the castle built from scoria pieces found at this hill by the Hussites in the Bohemian times that was called by the country-folks Pogányvár”. This Hussite legend was extrapolated by the public to the János Ördög Rock, too, saying the eponym of the rock is not else but Ján Giskra, Bohemina chief of the Hussites (Hunfalvy, J. 1867, Borovszky, S. 1903). The most relevant section of the matter of Pogányvár is made up by treasure myths fabling on gold hidden in the inside of the earth, treasures hidden in bowls or barrels and a golden veal serving as a pagan fetish. The best opportunity to obtain them was one of the marked days (St George’s Day, Good Friday) as then „gold was in lavation” indicating the site of its concealment by flames out of the ground. Observing the site of treasure flames led the miller of Ajnácskő to success who, as reported by Károly Pápai (1891), stroke upon, after a two-week-long constant digging, an iron chest ensheltering „all sorts of treasures and expensive merchandise” around Vaskapu located in the western hillside of Pogányvár. The ’hero’ of another treasure myth was put on the track of the treasure by a frog talking human language. As an award for the selfless manner of the pigman sharing his scarce food with the animal mentioned got an insight into the way of obtaining the treasure and acknowledged that on Good Friday when the Passion in sung in the church of Egyházasbást (Nová Bašta), a rock door at a certain point of the hill will open revealing the treasures hidden (Farkas, O. 2006, Magyar, Z. 2006). The country-folk’s fantasy was also moved by the caves of Pogányvár. According to one explanation, when the pagan Hungarians beat the Christians living on the hill (’Benedictines’), they „made their neifs carry soil to the top of that rock” (Magyar, Z. 2006). The entire area of Pogányvár is part of the Cerova Mountains Protected Landscape Area, and within that is strictly protected as a national natural reserve. 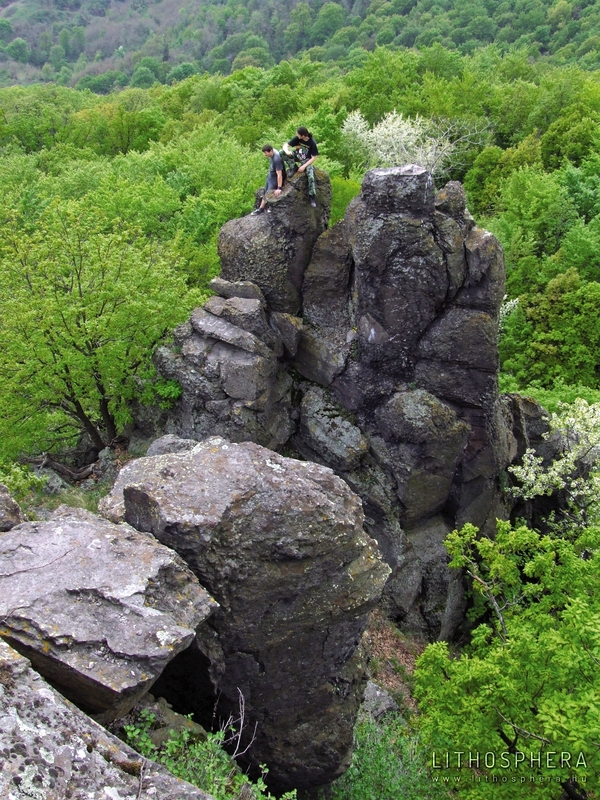 The Kis-kő (Little Rock), like the other volcanic formations of the Nógrád–Gömör basalt land, was formed during a basalt volcanic activity taking place in the Pliocene, ca. 6–2.5 million years ago. The springing magma when contacting the moisture of the ruptured sandstone and rhyolite tuff layers exploded, the glowing fuse exploded as various-sized volcanic material then when fallen back, depending on the sizes of pieces, was solidified as lapilli tuff, agglomerate and breccia. At the end of the volcanic activity, veins also intruded the diffused material (Prakfalvi, P. 2002). At the hilltop, a hollow natural in origin opens to the surface. This drop-shaped cave 15.6 m in depth and 30 m in total length formed provably simultaneously with the volcanic activity as dropstone-like lava flows can be observed on its walls. Its formation was usually explained by the explosion of hot volcanic steams and gases, i.e. a building-up of a gas cavity stagnated in the basalt (Gaál, L. et al. 2007). This is the largest lava cave developed in basalt in Hungary. In the basalt, locally amphibole minerals some centimetres in size occur that can be collected as weathered out from the rock at the foot of the hill. Such, minerals being rare regarding their size among effusive rocks were crystallised not after becoming exposed (as in that case they would be fine, due to the rapid cooling) but in the magma at great depth. The tile fragments on the ground and the remnants of ramparts well visible around the hilltop prove that the hill was protected human settlement. The existence of a Late Bronze Age settlement can not be excluded either, however so far only tile fragments typical for the era of the Árpád House were discovered. The owner and the time when the castle was constructed are not known neither is data available regarding its features and destruction. According to oral legends, the Turkish concealed treasures in this cave (Márton, F. 1996). The hollow broadening from the tiny surface opening towards the depth moved the fantasies of many hunters until, at long last, a horizontal tunnel was cut into the cave by local miners around 1909–1910 by Gejza Kemény nearby landowner. However, ‘the Turkish treasure’ has not ever been found. By the name Kis-kő Nature Conservation Area it is protected by law on local level. The exposure 500 m in length and 60 m in thickness is composed of sandstone developed in the Oligocene and Lower Miocene, about 19–23 million years ago (Pétervásárai Sandstone Formation). Its material is usually yellow-greyish fine- and medium-grained sand and sandstone with carbonate binder. Its lime content is typically around 14–15% however at some locations can be as high as 25–51%, due to such differences, harder benches crop out at many locations from the weathered, disaggregated sandstone or, as named based on their shape, so-called ‘loaves’ that as containing more lime or here and there more iron are more resistant against denudation processes. 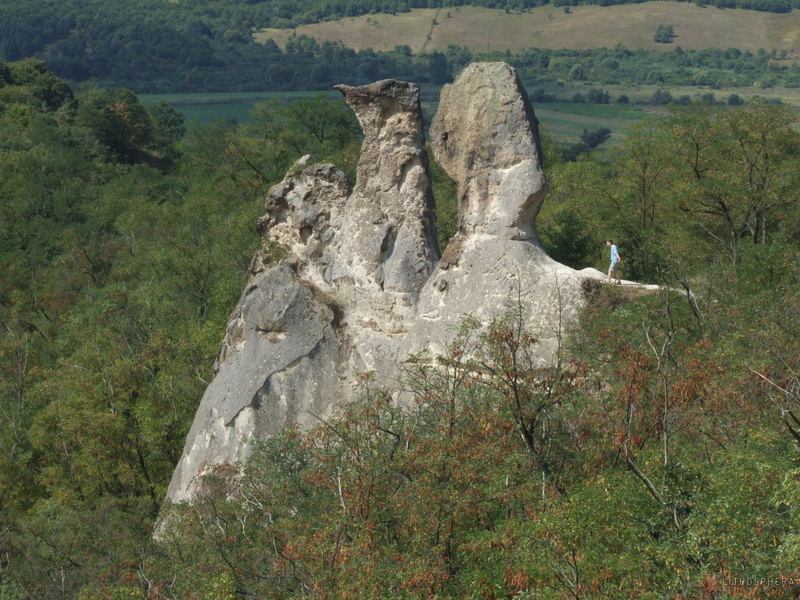 The loaves arranged in a NE-SW trending lines, between which countless minor hollows being the places of former dropped out ‘loaves’ run, are present as 50–60 cm wide and height ragged ribs that could be traced through 20-40 m. A rock formation at Istenmezeje is the spectacular and large-scale typical exposure of the Pétervásárai Sandstone picturesquely introducing the marks of this rock. Concretions elevated in more or less proper rows from the bumped surface of the rock formation composed of sandstone also called ‘apoka’ in Palóc Land reminded the country-folk of clear-fell rows of vineyards. To the origin of the rock formations, an interesting ‘propitiation-type’ legend, known in several versions, is linked (Magyar, Z. 2006): according the grapes were desired by according to the first, a pregnant woman, as by another, a beggar and as by the third, Jesus and Apostle Peter, however the vine-grower did not give them any thus it was accursed. According to Béni Balogh (n. a. ), the rock formation was named after a rich land-owner bearing the name of the biblical saver of animals who did not give any of the growth to a sick little girl thus was lapidified along with his vineyard by the curse of the girl’s father (see Lapidified Vine-stocks). Carved into the sandstone, an apsis of a church cave can be observed at the foot of the rock wall: it is represented in historical sources (around 1720, 1746, 1767) as a sanctuary. The nef and main façade was devastated during the 18th century (Bakó, F. 1997). The area is, as part of the Protected Landsape Area of Tarna Region, protected by law, and is managed by the Bükk National Park Directorate. Noah, the stomachful and evil-minded landowner was visited by a woman once on a sunny autumn day of vine-harvest asking from the abundant yield for her sick little daughter ‘obtesting for grapes’. Having heard the refusal, the mother accursed both the landowner and his vineyard. „– Ah, heartless, evil man! Ah, you Devil’s mate! … –Be accursed! Be accursed! Ah, I wish you and all your vine-stocks would become lapidified! And then, all of a sudden, it was blowing up for a gale. The October clear sky was darkened by clouds, and there was thunder and lightning. Then the hill was shaken by wild boom so that the grape-picker, black strangers were wailing and whining. But it was the stomachful squire roaring the loudest through fear. But there was no remorse! Suddenly, cords of flames shot up from the ground then the entire greenish-yellow vineyard was lapidified. At the southern part of the Medves region, in the outskirts of the Village of Nemti, a hill, named after its most characterisitic formation called Leány-kő (Maid Rock). It is the peculiar shaped zeuge is elevated in the foreground of a 50 m long vertical sandstone wall, at the upper third section of a rather steep slope. The binding agent of the bedded sandstone (Pétervásárai Sandstone Formation) is decisively carbonate. Coherent layers with higher carbonate content are more resistant against erosion thus are weathered out by selective denudation. In the formation of the sandstone column 6–6.5 m high along the slope, both corrosion of the arid periods and frost shattering of the glacials presumably played an important role. This is the only separate zeuge of sandstone in Hungary. The bizarre shape of Leány-kő moved the country-folk’s imagination, too. In the zeuge, based on the thick ‘stem’, the narrowing ‘neck’ above, the vast ‘cap’ on top and the ‘shoulder’ observable from various aspects at its side, a lapidified girl-shape was thought to be recognised (See The lapidified maid). Neither this rock feature nor its environs are protected by law, however based on its scientific significance, legal protection should be awarded. „The father went to reap to the Lyány-kő where there was a hayfield. Then while taking food to her father, the daughter was hungry so that ate up the lunch. He asked her daughter whether she had brought lunch for him’. She responded ‘no’. He said ’you have eaten it up!’. ’I shall be lapidified if I have had it!’. Then the daughter became lapidified that is the reason why that big rock is called Lyány-kő’. At the floor of the Csevice Valley deepened into Miocene andesite-type volcanic rocks, two springs rise: the Alsó– (Lower) or Hasfájós (Stomach-aching) ‘Csevice’ and the Felső– (Upper) ‘Csevice’. The water of these springs is rich in carbon dioxide and dissolved mineral substances (sodium, calcium, potassium, magnesium, etc.). Carbon dioxide is originated in the decomposition of rocks taking place at great depths, high temperatures and pressure and reaches the surface along thorough faults where it is captured in the water coming from the spring. It is only the Mátra region where such springs, called ‘csevice’ by the locals, can be found in Hungary. The average discharge of springs is 5–6 litres per minute (Fancsik, J. 1989) and there temperature varies between 3 and 15.5 °C. Both springs are tapped by local stones in an aesthetic way. 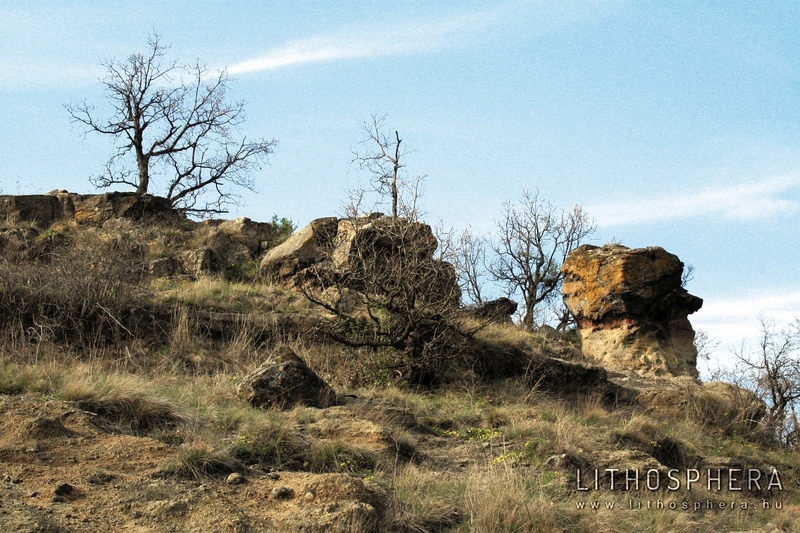 At the hillside above the Felső Csevice, interesting rock features arise. The lower part of the rocks with layered structure is built up of pyroclastite, a petrified product of explosive volcanic eruptions onto which andesite lava rock was deposited. Along the contact zone of the two rocks, due to the hot lava, the pyroclastite was ‘burnt’ as indicated by a red-coloured stripe. With the jointing of the lava sheet, as a result of external forces, primarily that of water and frost, cliffs and rock towers were weathered out from their environment. Sporadically at the hillside, globe-shaped rocks, smartly called ‘eyed stones’ by the local folks, can be observed. The hard rock cores developed due to weathering penetrating along spherical shell structures faces thus their outer crust is disjoined in an onion-skin structure. To the springs and rock formations of the valley at Tar, legends preserving the memory of King Sámuel Aba are linked. The bizarre shaped ‘eyed stoned’ rocks are called by local folks Aba Rock, whereas the Upper Csevice risen beneath the cliffs is thought to be the ‘tear spring of King Aba’ (see The tear spring of King Aba). The springs and their surroundings are protected by law on local level. The assemblage of rock of the Bába-kő (Midwife Rock) is elevated by 3–4 m from the foothill terrain of the Mátraalja slightly descending to the south. Its lithology formed during the final stage of Miocene volcanism, about 16–15 million years ago. These crags were considered by Noszky, J. (1927) geyser cones formed during the functioning of temporary spouting hot springs. Later studies claim that its material is not geyserite but rhyolite percolated by silica precipitated from hot springs (Varga, Gy. et al. 1975, Székely, A. 1985.). This assemblage of rocks was weathered out from its environs built up of softer rocks due to the quarzitic rock material’s high degree of hardness and resistance against erosion. Several folklores are connected to this eye-catching assemblage of rocks. By one of the superstitious folkways, it is thought that „witches used to be burnt here” – thus loud-mouthed women are still told „to be taken to the Bábakő” (Pásztor, J. 1929). According to another „the witch was chased by the ghost of the old Mátra, who could not catch her and, from spite, tossed this large rock to her” (Pásztor, J. 1929). 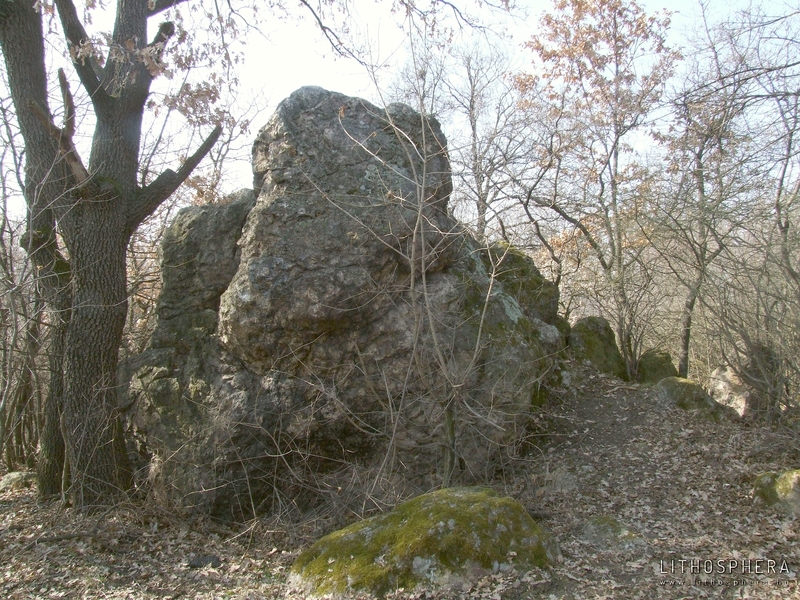 The third legend exemplifies the age of King Szent István (Saint Stephen I), the Christianization (see Devilish rocks – the Bába-kő). „At the part of the outskirts of Gyöngyös adjacent to the margins of Solymos and Bene, separate rock idols can be seen; according to the myth not remembering the times when they were worshipped as a counterpart of the Godhead, they were brought here by the devil. The Devil, willing to destroy the Church of Gyöngyös, armoured himself with these giant pieces of rock in the Mátra, however could not carry them any further. Having them dropped, they fell into pieces. 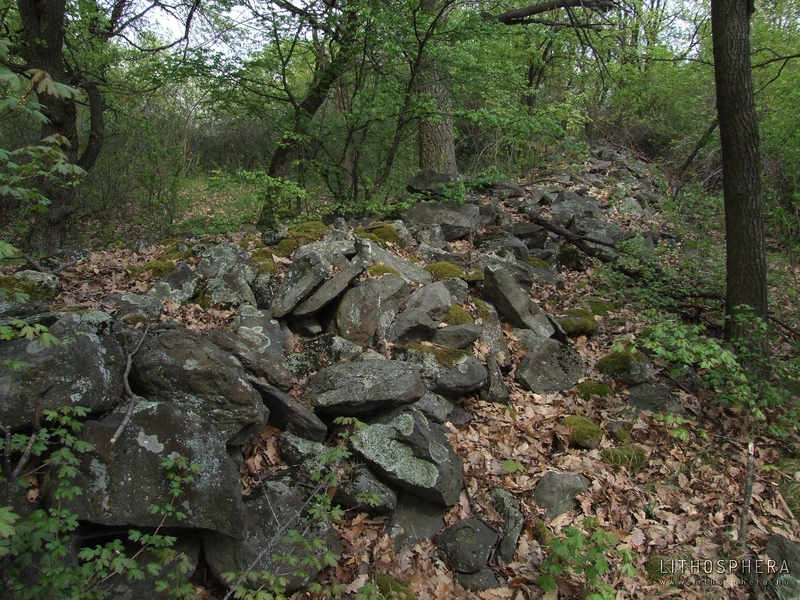 This assemblage of rocks, as part of the Bába-kő of Gyöngyössolymos and Csák-kő nature conservation areas, is under protection on local level. The pumice stoned dacite tuff (‘middle rhyolite tuff’, Tar Dacite Tuff Formation) building up the Vár Hill of Sirok was formed by extensive dispersion of volcanic detritus taking place in the Carpathian stage of the Miocene, approximately 17 million years ago. This event preambled the Mid-Miocene andesite volcanism (Badenian stage) building up the stratovolcanic chain, including the Mátra Mountains, that could be traced along the inner arch of the Carpathians (Varga Gy. 1981). Of the entirely or partly burnt volcanic tuffs, during the past millions of years, as a result of external forces, primarily water and wind, fantastic-shaped rocks were weathered out. In the development of these tuff towers, the primary slagging played a significant role as the tuff blocks formed from more slagged rock layers being more resistant to erosion. The most spectacular are the Barát (Friar) and Apáca (Nun) rocks whose sharp-edged columns are elevated by 5–6 m above the hillock. On the photos taken in the mid-1980s, a ‘head’ can be traced on the western block that was already lacking on photos from the end of the decade. The damage made to the zeuge must have been caused by the series of earthquakes observed at many times and locations around Sirok in 1986–1987. Into the horizontally carved surface of Törökasztal (Turkish table), bowls-shaped depressions, channels and holes were deepened whose functions are explained by the so-called ‘pagan’ sacrificial rites. During the sacrifices, the innards of the animals butchered were dissected by shamans called ‘bél’ lookers (the Bél-kő), altar lookers (Altar Stones in the Bükk Mountains) for prophecy purposes and were analysed in the depressions, cauldrons carved into stones with channels. Taking a look at the hollows, bowl-shaped incavations and rock cauldron with runnels carved into the peak of the Törökasztal of Sirok, – as well as the Nyerges of Eger, the Bányaél of Demjén, the Hegyeskő Hilltop and the other beehive rocks at the Bükkalja region, the cultic rites of the old days that can be reconstructed by the work of Arnold Ipolyi, quasi come to life (see Cultic rites of the old days). The three rock columns with bizarre shape on the hilltop, the so-called Bálványkövek (Idol stones) nice myths of origin were poetized by the country-folk. By folklore, they are called „Turkish man, Turkish Woman and servant”, and „Priest, friar and nun” as well as „rock men” – the related mythology, the legend telling the tragedy of King Darnó’s daughter Tarna and the gallant heroic Bodony was worked up by Kabos Kandra (1901). The story occurring at other times also contains the folk etymology of the name of Sirok. 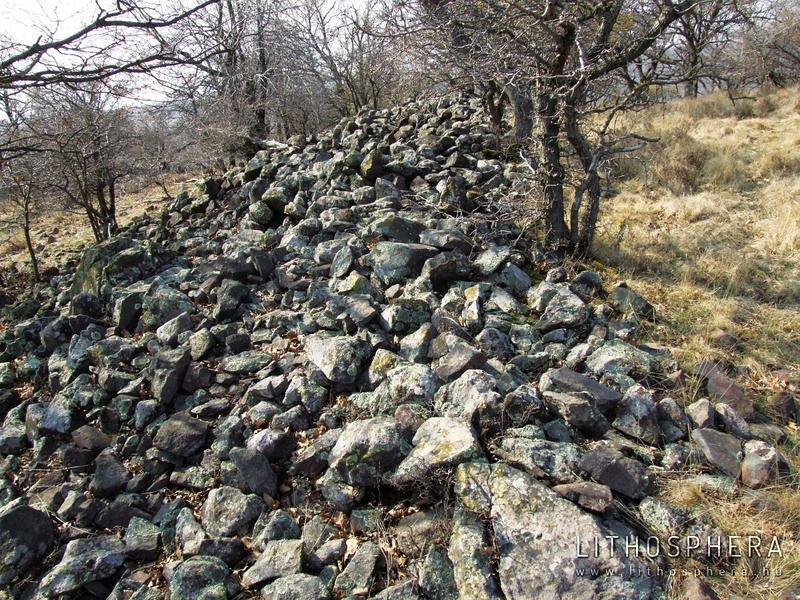 This assemblage of rocks is, as part of the Vár Hill of Sirok Nature Conservation Area, protected by law on local level. 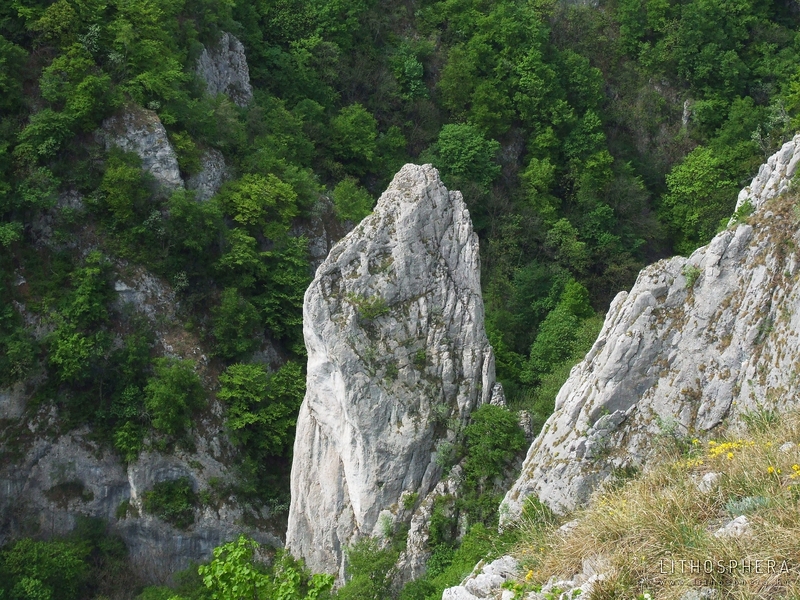 The rock of the Bél-kő’s white limestone crags was formed in a shallow sea during the Triassic period, about 239–225 million years ago. The karstic limestone of the Bükk Plateau is also built up by the same rock thus they are collectively referred to by experts as Bükkfennsíki Limestone Formation. It is hard to deduce the circumstances it was formed as it is anchi-metamorphized), thus sedimentation features have mostly vanished. Despite this, coral reef, fine-bedded lagunal, crinoidic and slightly deeper water facies can be distinguished. 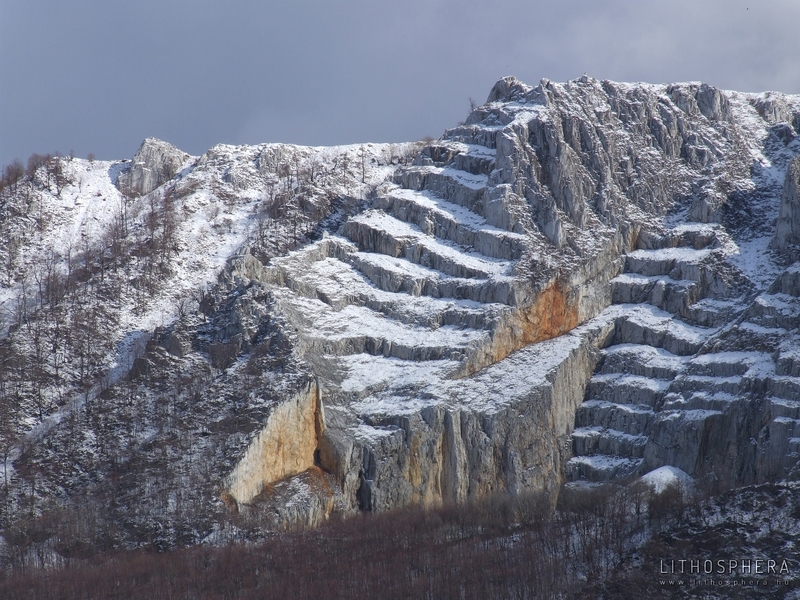 Rocks of the Bükk Mountains were exposed to orogenic impacts for several millions of years resulting in the originally horizontally deposited layers of limestone building up the Bél-kő becoming intensively folded and were foliated parallel to the folding middle surface and have become lamellar in cleavage. These flagstones lying flatwise are neatly shown up at the south-western pike of the Bél-kő. The hill is the westernmost member of the vertical or even overbent limestone-walled edge crags, the so-called ‘rocks’ (Bél-kő, Őr-kő, Cserepes-kő, Pes-kő, Tar-kő, Három-kő) aligned at the boundary between the Nagy Plateau and the Southwestern Bükk Mountains. The southern rim of the plateau is, according to the general supposicion, a fault line in the contact zone of the limestone and schist. In the contact zone of these rocks with different quality, in the strips cropping out as bassets, along the rock gaps and laminated sheets, denudation processes accelerated, solution, weathering and frost shattering became more intensive due to which the steep limestone walls undergo continuous downfall. As the break-up, weathering of slates is more rapid compared to that of limestones, thus after having their constraints lost, they were further ripped and, by this, establishing this chain of immense rock walls. Prior to the beginning of quarrying, with its rock façade being ca. 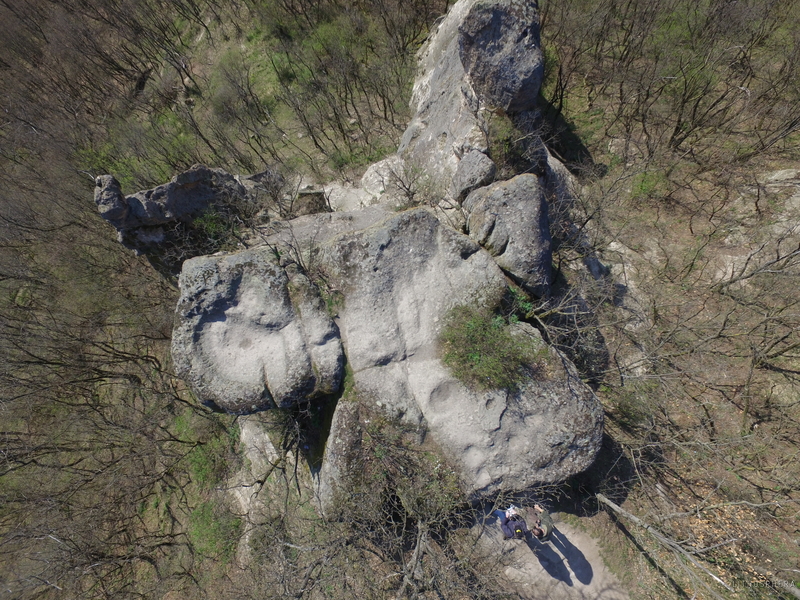 400 m in length and 75 m in height, the Bél-kő could have been one of the most spectacular rock features, as also evidenced by engravings from the 19th century. The name of the Bél-kő itself is the incarnate sacrality. As a first approach, this appellative noun means the interior (or, figuratively, the substance) of something in Hungarian. According to Ferenc Kállay (1861), however, the root bal (left) and its high vowel couple, bél, can be deduced from the names of Bál and Bél; he also claims that the Hungarian word bálvány (idol) can be derived from the Gods’ names Bál, Bél, Belus and Balázs. In addition to the Bél-kő located in the Bükk Mountains, the geographical names Bálvány, Bála Valley (1248/1326: Balauelge etc. ), Belvács or the nearby Balla (Mátraballa), Balaton etc also imply a mythological origin.6 The sacrality of the Bél-kő and its vicinity are referred to by other cultic denotations, religious toponyms tracked here as for example the Áldozó-völgy (Sacrificer) Valley), a Bácsó-Bükk (Bácsó Valley, Bácsó Hillside, Bácsó-kő), Csortos-kő, as well as at the opposite valley side, Ördög-gát (Devil Bank), the nearby Oltár-kő (Altar Stone), Ördög-hegy (Devil Hill) etc. Among them, the most interesting is the group of toponyms starting with the word bácsó. The Hungarian word bácsó is synonymous with the Transylvanian bácsi (uncle), Palóc bacsa words meaning ’old shepherd, head shepherd’. He is the oldest, most experienced and has the greatest knowledge among the shepherds understanding nature, can read from the stars as well as cures sick animals and human beings. As pointed out by Mátyás Jenő Fehér in one of his books, the Hungarian words bacsa and bácsó do not only preserve the mementoes of the primordial herding but also the name of a ecclesiastic function lower-ranked then shaman. It was no coincidence that the evanescent races of the primitive religion, the ‘pagan’ religion were sought in this area by Gyula Bartalos, Kabos Kandra and Frigyes Türk at the lat 19th and early 20th century. Analogous conclusions were drawn by Arnold Ipolyi regarding the Bél-kő and its surroundings in his essay written in 1866 on the Cistercian monastery at Bél-háromkút: “Beneath the Bélkő the toponyms Áldozókő and Hamuhegy can still be found suggesting that here, among the three springs under the rock pike of Bélkő there could have been a notable pagan place of sacrifice enshrinely visited by thousands of folks even after having the new religion embraced, and to the spring water they found remedies in their discomfort by bathing, a miraculous vigour was attributed and is still attributed since at this place, a monastery was built to whose church and sacred wells, thousands of the country-folk held their saint’s-days” (Ipolyi A. 1866). The Cistercian monastery of Bélapátfalva was built here, next to former ‘pagan’ cultic centre framed by the Bél-kő elevated above the Béli Basin, the springs of Bélháromkút and the Bácsó-Bükk in the 18th century by no coincidence. Nor is accident that the wonderful, mysterious escape of King Béla IV against his pursuers is linked to the Bél-kő and the Cistercian monastery then under construction. The Cistercian Monastery of Bélháromkút named after the Blessed Virgin Mary was established in 1232 by Kilit (Cletus) II, Bishop of Eger. In the mid-16th century, the abandoned monastery became ruined, its church was reconstructed only in the 18th century and was re-consecrated by Gábor Erdődy, Bishop of Eger in 1744. 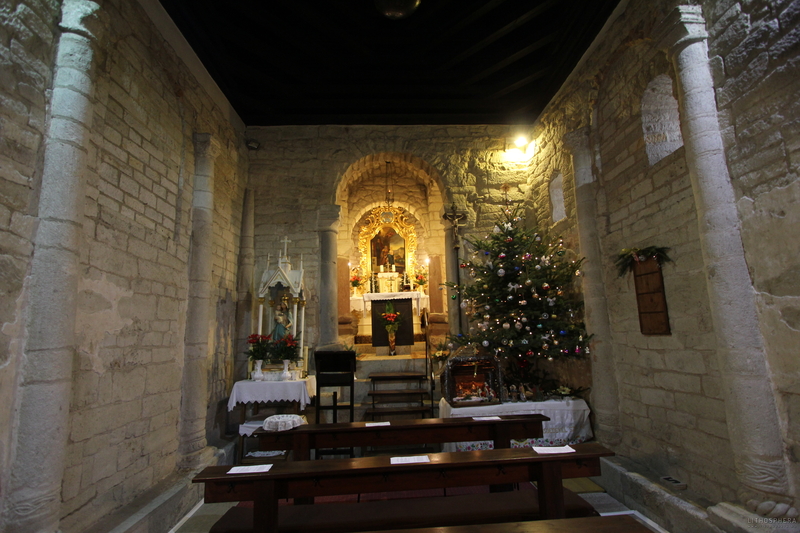 The medieval church of the Cistercian monastery of Bélapátfalva, where the cults of Mary and the Trinity are alloyed, is still an existing shrine in honour of Virgin Mary. The main saint’s-day is held on the Feast of Assumption (on 15th August) as well as a minor pilgrimage also takes place on the Saturday before the Sunday of Trinity. The south-western cliff pike of the hill is, as part of the Bükk National Park, under protection since 1984: of the area of 39.8 hectares, for 23.4 hectares, strict protection was declared. In 2003, following the cease of quarrying, the procedure to recognise the former quarry as a protection site also began. Geological formations predominating in the Bükkalja region were developed as a result of the volcanic activity starting in the Ottnanian stage of the Miocene until the early Pannonian stage (21–13 million years). Here, the volcanic activity primarily produced detritus present in the region in three well-distinguished levels of tuffs. Between the various intensity eruptions, non-operative periods with various lengths in time were experienced. The first stage of volcanism was the most intensive and also the greatest regarding its spatial distribution. The so-called Gyulakeszi Rhyolite Tuff Formation (or as conventionally known, ‘lower rhyolite tuff’) is fallen avalanche and redeposited or phreato-magmatic rhyolite tuff variegated by ignimbrite and ignimbrite benches. Most of the beehive-rocks in the area (58 of the 38 beehive-rock localities’ 72 rocks) were weathered out from the material of this formation. Some chambered rocks are composed of the ignimbrite of the Tari Dacite Tuff Formation burnt to a various degree (‘middle rhyolite tuff’) – Miocene, end of the Carpathian stage; estimated radiometric age is in the period between 17.5 and 16 million years ago). 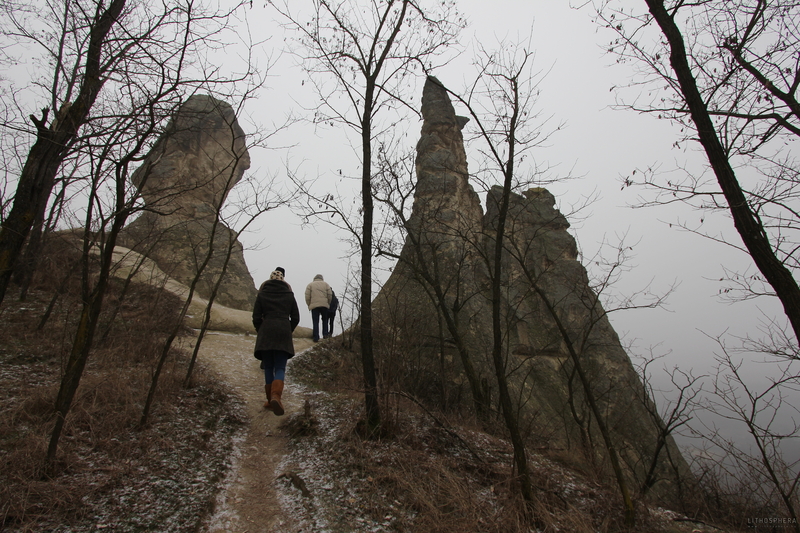 At the hillside of the Mész-tető, during the past millions of years, cone-shaped rocks were weathered out from the volcanic tuffs as a result of external forces, primarily of water and frost shattering. According to the research carried out by Balázs Borsos (1991), the foliated, slightly spherical shell structured crust covering the rocks might have had a significant role in the relative ‘elevation’ of the cone-rocks to their environment. The cinder cone of the Ördögtorony (Devil’s tower), representing the advanced stage of beehive rock formation, has an elevation of approximately 8 m from the hillside to which it is attached with a subsided hillock only. 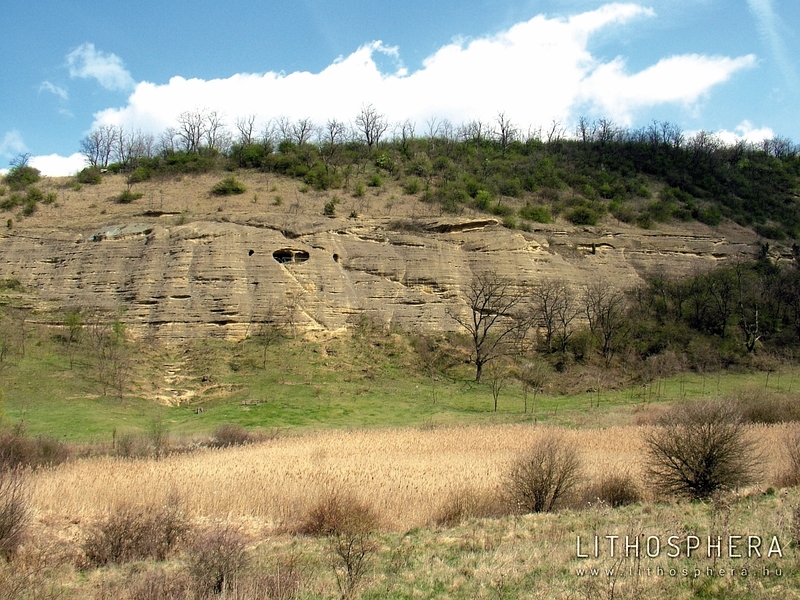 The nearby decaying rockslope, rather smartly called Ördögcsúszda (Devil’s slide) by the country-folk, is built up of soft rhyolite tuff (loose ignimbrite) that is, due to its low grade of cementification and high pumice stone content, indicated low resistance against erosion. To the formation of the bare rock surface, the extinction of the natural forest cover also made a contribution accelerating the otherwise also high-scale erosion processes on the steep hillslope. The Ördögtorony is one of the 72 known beehive-rocks from the 38 sites in the Bükkalja region. To the side of the cinder cone, 3 chambers are carved. On the fortressed settlement of the Kyjatice culture can be found on the Meszes-tető with an extent of 5.86 hectares. This area is, as part of the Bükk National Park, protected by law and is managed by the Bükk National Park Directorate. 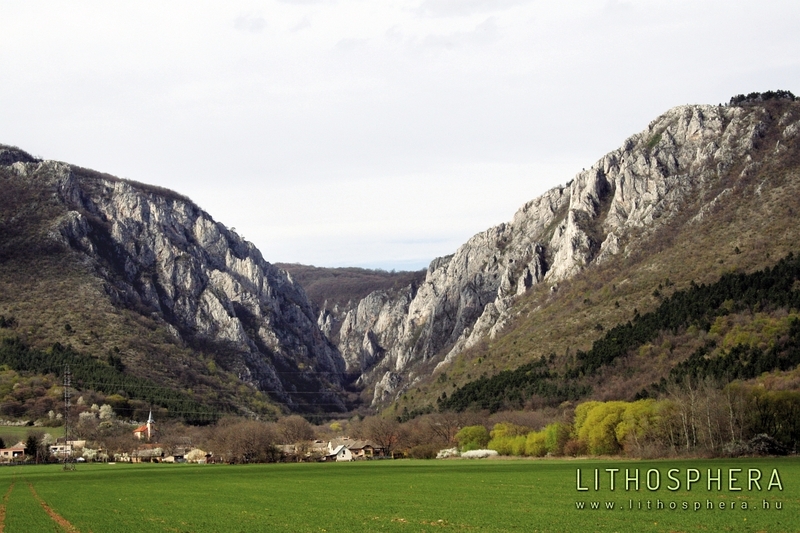 The spring rises at the foot of the rock façade of the Imó-kő built up of light-grey limestone (Répáshutai Limestone Formation) formed in the Triassic, about 220 million years ago. For most of the year, it has no water discharged and is perfectly desiccated. At springtime, following thaw, however, strange muttering is heard from the spring mouths then water starts to flow in thick jets. The duration of functioning depends on the amount and intensity of precipitation. In years with a high amount of rainfall, it often runs as long as early summer. It also occurs that the spring becomes activated even after violent rains of some days. On the contrary, when dry winter and gradual warming up is experienced, it may not even run. The intermittent water flow is the consequence of the rise and lowering of the mountains’ karst water level, correlating with the seasonal changes of the weather, as well as the specific rock arrangement features. This spring, due to the settlement of the intercalating limestone of the eduction passages, becomes active when karst water level being elevated siphon-like, above certain threshold level. Among Hungary’s intermittent karst springs, the Imó-kő Spring has the highest water discharge and thus has the most spectacular functioning. During its active period, the amount of water brought to the surface is typically 80 litres per minute however, values as high as 220 litres per minute were also observed. The total length of the predominantly detritus-free, slightly descending passages of the spring cave opening here is, due to the, regular water flow, 70 meters. 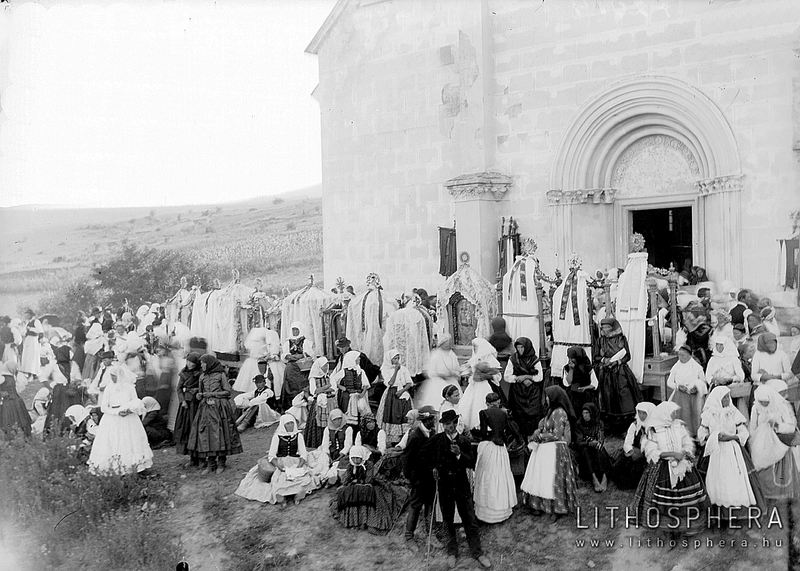 Gyula Bartalos in the 1880s discovered the Imó-kő through the „living folk mythologies” that he considered, along with the nearby Tűzköves, the altar-stone of the pagan religion. „…at both sides of the Imókő Crag, bastions arise, its ridge is rather narrow; it was made to be a fortressed site created by nature and quasi offered itself as a bulwark … On the steep pike of the Imókő, a room-sized chamber can be observed: by this place, rock and the occasionally jetting spring underneath, and especially the name and the legend on the rock by the country-folks, the pagan altar-stone and even the water cult of the Hungarians come up unfoundedly.” – as written on the rock and the spring risen at its foot (by Bartalos, Gy. 1887). Regarding the origin of the name, he proposes the following: „…Imókő, there is no need to have it explicated as says itself that an antique verb ‘im’ is proposed and the present ‘imó’ was formed from that.” According to the thesaurus by Czuczor–Fogarasi, the root of the im interjection, from which the words ima (prayer), imád (adore), imádság (prayer) are originated, is the phone i referring to közelség (nearness). The authors claim that the forms im and ima phrase the deepest adoration by the Hungarians. 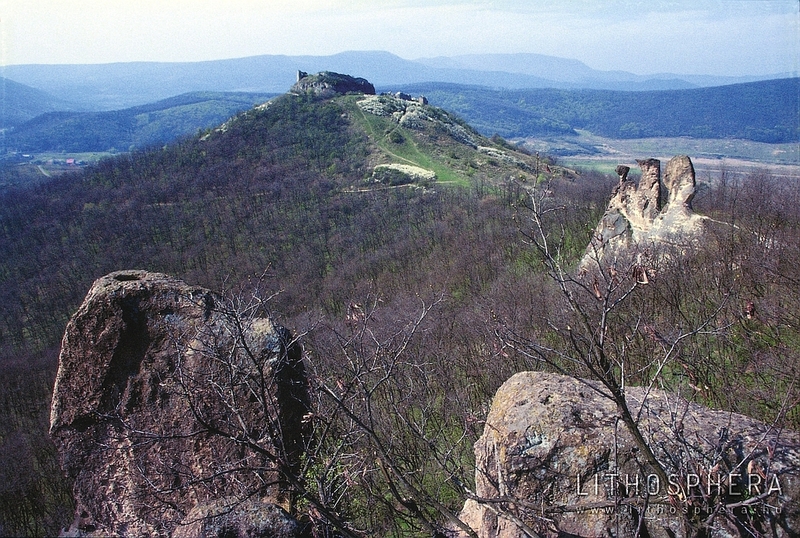 The rock of the Imó-kő is elevated in the strictly protected area of the Bükk National Park. The spring and the cave are also under ‘ex lege’ protection and is managed by the Bükk National Park Directorate. The Tó Hill is built up of limestone formed in the Mid-Triassic, approximately 230 million years ago (Wettersteini Limestone Formation). As a result of its chemical composition, the light-grey coloured rock of marine in origin is rather soluble. These waters abundant in carbonic acid and other acids shaped diverse landforms, so-called karrens on the surface of the limestone during the millions of years. The round-shaped, elongated hollows, the so-called root karrens carved in the limestone rock formed underground, covered by soil and detritus sheet (covered karrens). Tree roots in the soil produced organic acids dissolving the rock in their neighbourhood. The root steadily grew into the soluted part thus, locally arm-thick tubes formed. The root karrens evidence that the hillside being treeless today used to be covered by forests. At the outskirts of the village, the forest was exploited and was replaced by farming initiated, as shown by historic maps, this is where the village’s vineyards used to be found. The soil disrupted by farming was quickly washed down from the steep hillside resulting in the cease of production. With the denudation of soil and detritus covers the limestone with an already joint surface cropped out. The forming of cliffs went on the surface with, in addition to the solution, the mechanical effects of the water flowing down on the slope but break-up also had a significant role. The resultant uncovered karrens occur in a great diversity at the hillside. Along the slope, fine channel karrens, longer and deeper fissure and crevice karrens run with narrow parallel rock ridges among them. At some locations, circular or elliptic soluted hollows are deepened into the rock surface. This is one of Hungary’s most diverse karrenfelds providing a good display of karstic processes under the temperate climate. At the site of the Lake Aggtelek or as also known Lake Káposztáskert (Cabbage garden) at the foreground of the Tó Hill, at the early 20th century, there used to be a sinkhole surrounded by cabbage gardens. The rainwater flown into the sinkhole formed one of the main side-passage of the Baradla Cave, the Törökmecset Passage 1 km in length. Later, in the sinkhole, the rock detritus, clayey detritus and soil dumped with the water from the hillside started to be accumulated and the neck gradually blocked. This process was started off by the exploitation of the forest cover, cultivation of the area as mentioned earlier, as resultantly the amount of eroded material had significantly increased. In the closed depression without run-off, rainwater had gradually assembled forming today’s lake. From the dead water, some water, through minor cracks, fissures still filters to the cave passage supplying its intermittent brook. This is the only occurrence of sinkhole lakes in Hungary. The karrens are called by the Hungarian folk-speech Devil’s ploughland and considers that these sharp limestone rocks became exposed due to the Devil’s plough. To the formation of the Lake Káposztáskerti found in the foreground of the karren, an explanation is also given by a myth. According to the legend, water streamed up from the depths in the former cabbage garden when a local girl intended to throw an unwanted child into the well here (see Lake at the cabbage garden). This area is under legal protection as part of the Aggtelek National Park, and is managed by the Aggtelek National Park Directorate. 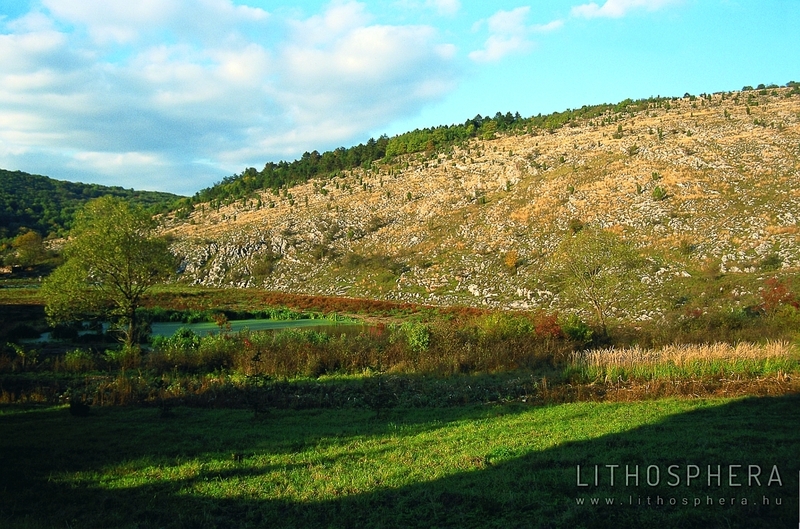 The Szádelő Plateau is built up of limestone formed from carbonate sediments deposited in shallow-sea reef and lagoon environments developed in the Mid-Triassic period, ca. 230 million years ago (Steinalm Limestone Formation and Wetterstein Limestone Formation). The area, impacted by orogenic forces became a continent in the Cretaceous period than gained its final structure during the tectonic movements. The uplift of the karst plateau was associated with an intensive cutting of a valley during which in connection with the fault lines, at some locations, deep gorge valley were developed. Along with the uplift, intense karstification also began. Underground brooks of the limestone terrains at some locations carved extensive cave systems that, by the progress of karstic surface denudation, could collapse and open to the surface. The Szádelő Valley is claimed by researchers as one of the good examples of valley formed by cave collapse (Zámbó, L. in: Borsy, Z. 1993). 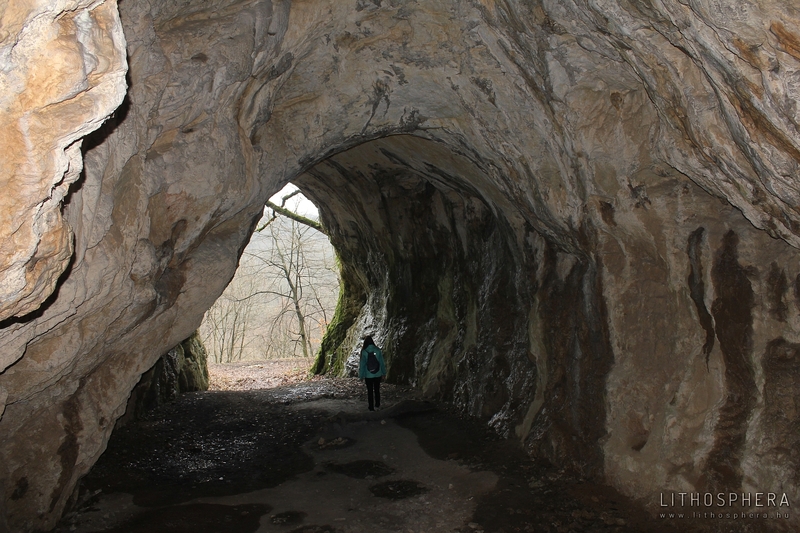 The ceiling of cave passages formed by the Szár Stream reaching the limestone area from the Szepes-Gömör (Spis-Gemer) Ore Mountains built up of crystalline rocks ruptured gradually. Remnants of the former cave can not be observed today as they were destructed by the brook still unremittingly rubbing the valley floor. On the peculiar cliff walls, however, remnants of some side-passages of the former cave can still be seen today at some locations (Király Cave, Csontos Cave, etc.). 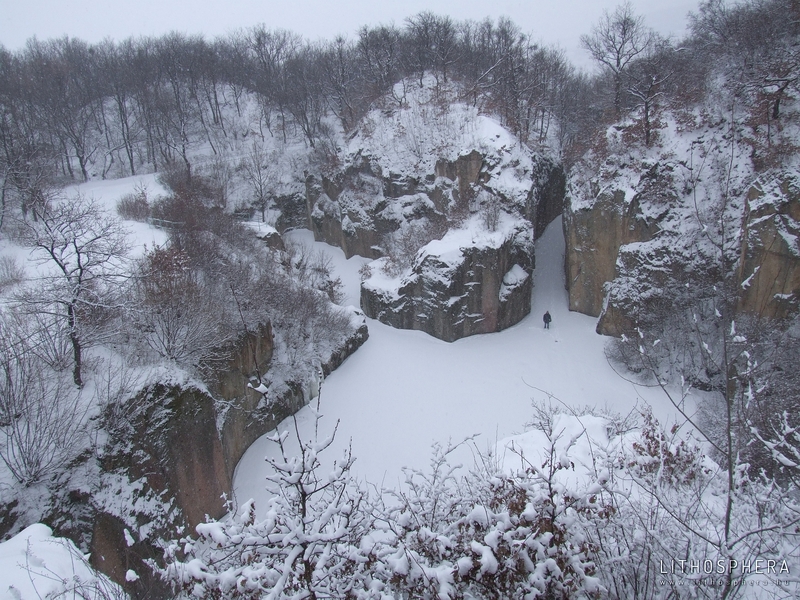 Sides of the narrow gorge are jointed by sharp limestone columns – the most well-known are Cukorsüveg (Sugar Cane) with a height of 105 m, the Oltár-kő (Altar Stone), the Ravatal (Catafalque) and the Megkövesedett pásztor (Lapidified Shepherd). The Szádelő Valley has a rather rich world of legends: the landscape is sacralised by historical people (sons of the Great King of Huns, monarchs of the Árpád House) as well as other archaic myths of origin. Another legend explains the formation of the gorge valley as follows: “Once upon a time when gods married on the Earth, the Devil also took fancy to such earthly adventure. He thought to himself to go up to find a girl. He heated his father’s smithery to an extent causing the Szádelői Hill got ruptured to its feet” (Stibrányi, G. 1993). It should be seen however that the ‘forefather’ of Tolrna and the entire Palóc Land is not King Szent László but Attila the Great King of Huns. Ancient myths telling the battles between Attila and Buda was discovered by Gyula Bartalos in the environs of the escarpment at Szádelő, under the rocks of Kégród (Kőgarád) ranging to the Pipitka Hill, at the foot of the Ancient Castle of Dernő in the last decades of the 19th century: “The fortress besieged by Attila, the road of escape on Buda moved forward, the rampart where they fought again and, eventually, the site of the final battle, the place of the fallens’ Cumanian mound were pointed out and indeed, the traces were visible and in the area the name of outskirts also refer to the Cuman as the German »Hekke-Rova«, March of Rof, Kis and Nagy Budatelke, Hetény etc.” (Bartalos, Gy. 1901). Gusztáv Stibrányi (1993), based on the telling of Sándor Józsa, a farmer of Szádelő, a myth of Torna was told on the sons of Attila: the vast rock mass in the section of the Szádelő Valley between the Cukorsüveg (Sugar Cane) and King’s Well, called Ravatal (Catafalque), also mentioned by folks as Dengizich köve (The Stone of Dengizich), is thought to be the tomb of one of Attila’s sons. Legends on King Béla IV are also known. This is the area where, following the loss of battle at Muhi, the king along with his few adherents was escaping. Folks residing here were helping and concealing him everywhere for which Tornagörgő, Körtvélyes, Szilice and Ardó after 1241. One of the springs found in the Szádelő Valley is still called King’s Well while one of its subsurface cavern is called King’s Cave as according to the folklore the king found shelter here for several days. From the cave only 17 in length, archaeological findings from the 11th to 13th centuries as well as from previous times, similar to the more extensive Csontos Cave that prove the valley was resided as early as the Neolithic, Late Bronze Age, Iron Age and the Roman Times. It had an especially important role during the Lathenic Period when linking the iron ore sites around Barka and Dernő with the southern trade-routes. As iron played a central role in the life of Celtish, the Szádelői Valley as important route was well-guarded. Remnants of the Celtic fortresses found at the valley opening are also evidences. To the rock tower of the Cukorsüveg (Sugar Cane), the tragedy of young lovers is linked (see Stipa on the Cukorsüveg (Sugar Cane)), in another local formation, local envision a petrified infernal shepherd whereas to a stone river (‘Urak ergetője’) the history of the battle between the local lord of the manor and his folks. The two parallel incavations in one of the rock walls are thought to be wheel-tracks with its origin is associated with the Devil’s wedding-trip. The day when the lad should kiss Klára on the Cukorsüveg was set. A huge audience came together from the village and waited for the lad’s destiny with heart-strings. The girl was already standing on the pike encouraging the lad with her eyes. He was, though, slowly weakening with the girl spontaneously snatching him but also failing. She was dragged down by the falling lad to the depths. They were united in their death and are buried at the foot of the Cukorsüveg. This area is under legal protection as being part of the Slovak Karst National Park (Slovenský Kras Národný Park). It has been protected by law since 1954 therefore is among the ptotected areas in Slovakia with the longest history of protection. The Buzgó Spring rises at the northern foot of the Szilicei Plateau 450–650 m in height. The maximum water discharge of this affluent karst spring can be as high as 1300 litre per second and does not decline under 6 litres in more arid periods. In the environs of the Buzgó Spring other springs with lower discharge also depleting the plateau’s karst water supply. 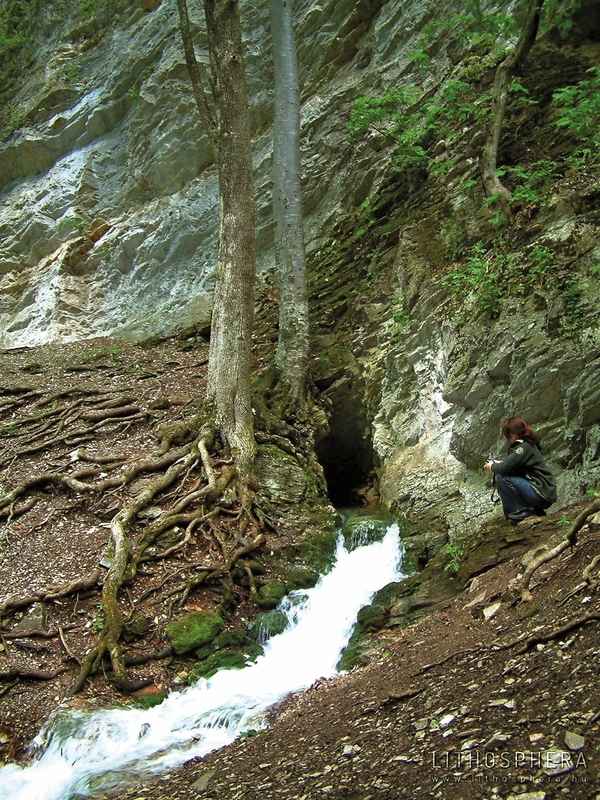 Spring water flows to the Cremosna Brook (Čremošná potok) through wonderful travertine dikes. Behind the Buzgó Spring is the longest known cave of the Szilice Plateau called Buzgó (or Krásnohorská) Cave. The underground passage, with its presence being presumed for a long time, was discovered in 1956 when the earthworks were put to carry out by the Town of Roznava in order to have the spring connected to the water supply. The most outstanding sight of the cave being at present 110 m in length, at some locations, abundant in dropstone formations is a giant drop-made column 32.7 m in height being the second largest in Europe in its kind. The other such interesting formation of the cave is the Nagy (Big) Canyon being in general 2.5 m wide, 10 m deep and 170 m long with an underground brook distilling at its floor. This immense escarpment came to existence due to a tectonic fault with a dip of NE-SW that played a key role in draining karst water accumulated in the inside of the plateau. On its walls, locally vertical or slightly lodged flat limestone surfaces, so-called tectonic surfaces that were rubbed as a result of displacement of two vast limestone blocks. The Buzgó Spring and its surroundings are one of the youngest shrines of the ‘place of worship line’ located between Krásnohorská, Hárskút, Barka and the Szent László Spring at Debrőd. Its history roots back to the 1890s when a home-folk girl called Júlia Szakali walked to the spring in order to pick up flowers where she conceived to see Virgin Mary soaring among the trees (Bálint, S. 1944). Due to Júlia’s revelations, pilgrimages began immediately. Later on, the extraordinary power of the spring’s water proven by miraculous recoveries was also discovered. The spring was dammed off in honouring the immaculate conception and Virgin Mary of Lourdes. The chapel manifold reconstructed today is of Lourdes cave type. At this place of worship, saint’s day is held by the congregation on the first Sunday following the Feast of the Assumption (15th August). This area is under legal protection as being part of the Slovak Karst National Park (Slovenský Kras Národný Park). At the northern foot of the Király Hill, the spring risen from rhyolite rocks of volcanic in origin, is one of the coldest springs of the Tokaj Mountains with, instead of an average temperature of 8-9 °C, being permanently around 4 °C. It has an average water discharge, based on the results of measurements carried out between 1951 and 1978, is 18.8 litre per minute (Izápy, G. – Maucha, L. 1996), therefore, in accordance with the Act on Nature Conservation of 1996, it is classified as an ‘ex lege’ protected spring. The spring was dammed off in a quasi-natural way by using local rocks. By the name of the spring, the legend of the romantic meeting of King Matthias Corvinus and Ilonka Szép is preserved. The legend is also mentioned by Mór Jókai and Mihály Tompa.8 The symbolic grave of Ilonka Szép in front of the spring was built up in 1932 by Bálint Tóth, a forester from Gönc. According to another myth, Bandi Angyal a famous robber of the Great Hungarian Plain coming from the nearby Nyíri bathed his newborn son in this spring. The area, within the frame of the Zemplén Protected Landsape Area is protected by law. The spring is under ‘ex lege’ protection. Nature conservation management duties are fulfilled by the Aggtelek National Park Directorate. With his accompaniment, King Matthias once was hunting on the crags of Abauj. But as soon as reaching a cheery hunting lodge, around the burning fire, the troops settled down on the green grass to unbend; As the heavy cup goes round, the fatty deer is frizzled on the sticker-up, then talk is altered to lively dispute on the bliss of the Sun and its throw-backs: King Matthias did not speak to anyone, turned and tumbled – and suddenly disappeared! Once as having left the cottage, on his way he hit upon a cold spring at the eastern side of the foot of the hill. This old spring at the foot of the hill should be named King’s Well. Its spring water that once cooled down to ice-cold will quench the roamers’ thirst and will knock their teeth… — Its story is told by the tale. 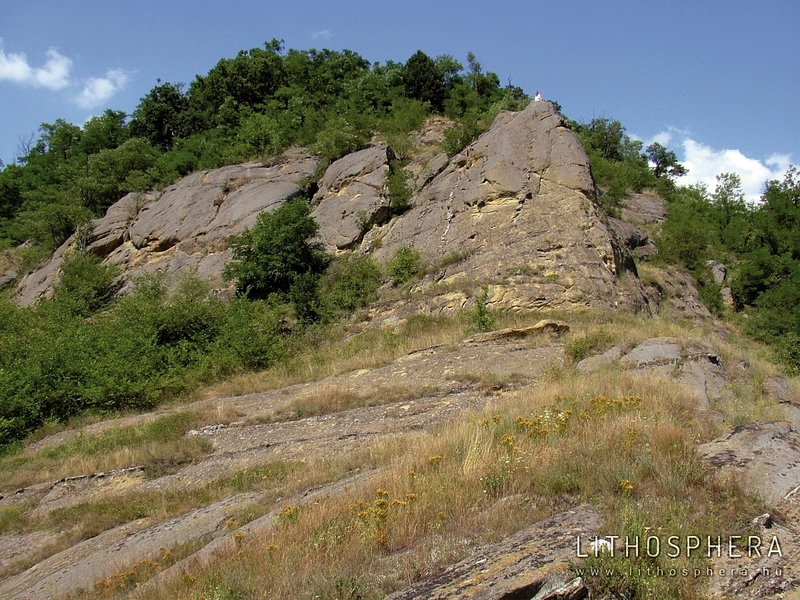 The andesite rock mass at the bottom of the Nagy-oldal-tető hillside elevated near Regéc developed during the glacials of Pleistocene. On the hilltop, as a result of frost shattering, a cliff emerged of which smaller or larger pieces of rock regularly disjoin and occasionally immense rockslides took place. The hillside, in front of the escarpment, is covered by detritus typically becoming finer downward the slope and among the rocks, the share of soiled part also increases. Rock masses developed by rockslides interbedded into a finer material and moving along downward the slope could often cover great distances. The Rákóczi-kő is one of the beautiful occurrences of such developed glide blocks. 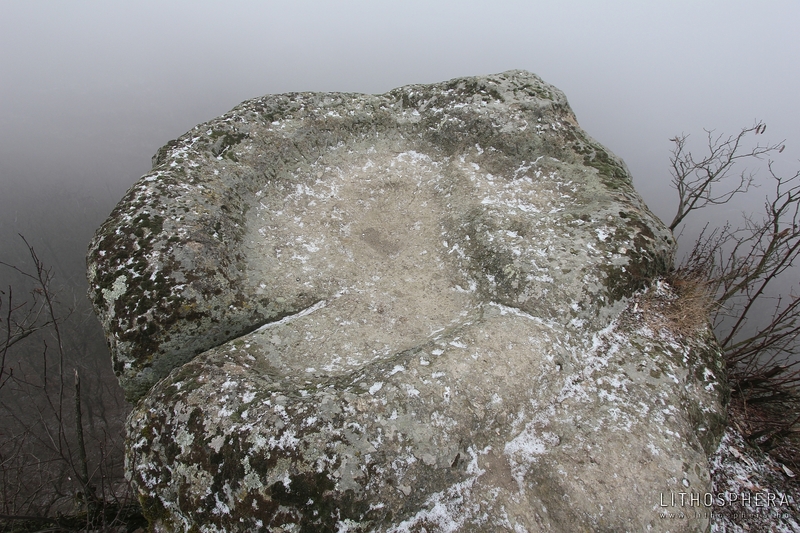 As by the belief, the shoe of Sovereign Rákóczi’s horse can be seen on the rock formation (Tamáskó, Ö. 1958). The incavation was cut into the hard andesite when the sovereign with his horse jumped here with a single movement from the Castle of Regéc at a distance of approximately 3 km. According to another, more bound-to-earth explanation, the cliff was a favourite destination of the sovereign during his usual spending some of his childhood in the Castle of Regéc – this is where the name is arisen from. Another legend is mentioned by Magyar, Z. (2000/b) according to which the sovereign spent his lunch on the flat rock and was consulting with his men: “his golden plate, golden spoon and golden fork are still under the rock” and “around are twelve stones on which they sat”. 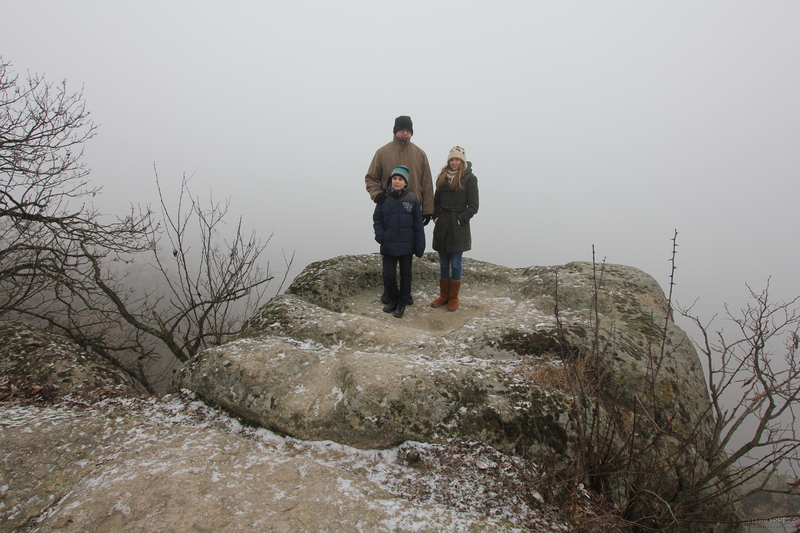 The cliff is also known as the Table of Robbers as, according to an invariant story, this is the place where Sovereign Rákóczi and Sándor Rózsa met. It is, as part of the Zempléni Protected Landsape Area, protected by law and is managed by the Aggtelek National Park Directorate. The hummock of the Nagy-Kopasz (Nagy Hill, Kopasz Hill) being 515 m in height emerged during the Sarmatian and Lower-Pannonian of the Miocene (approximately 10 million years ago) and is typical strato-volcanic cone resultant from periodic surface volcanism (Gyarmati, P. 1977). The hill’s dacite material (Tarcal Dacite Member) was excavated in nearly 25 smaller or larger quarries. Exposures of such quarries advance the studying of the hill’s inner structure. According to Anonymus, this elevation was previously called Tarcal Hill after the chief being the winner of the race among the three out-guards of the Hungarians (Ond, Ketel and Tarcal). To the hill, an origin myth going beyond earth scientific aspects (see ‘The Olympian Hill’ – The Nagy-Kopasz of Tokaj). As by another legend, the hill used to be one of the most important assembling places of vixens from the nearby areas (Tamáskó, Ö. 1958). At the foot of the hill, once a Pauline abbey stood with also the toponym Dobogó found at its neighbourhood, similar to many other Pauline abbeys. The area is, as part of the Tokaj–Bodrogzug Protected Landsape Area, protected by law and is managed by the Aggteleki National Park Directorate. Hevesi Attila (2002): The geographical location, development and climate of the Bükk Mountains. In: Baráz Csaba (ed. ): A Bükki Nemzeti Park. Hegyek, erdők, emberek. Bükki Nemzeti Park Igazgatóság. Eger. Rózsa, Péter – Kázmér, Miklós – Papp, Gábor (2003): Activities of volcanist and neptunist ’natural philosophers’ and their observations in the Tokaj Mountains (NE Hungary) in the late 18th century (Johann Ehrenreich von FICHTEL, Robert TOWNSON and Jens ESMARK). Földtani Közlöny. 133/1. pp. 125–140.